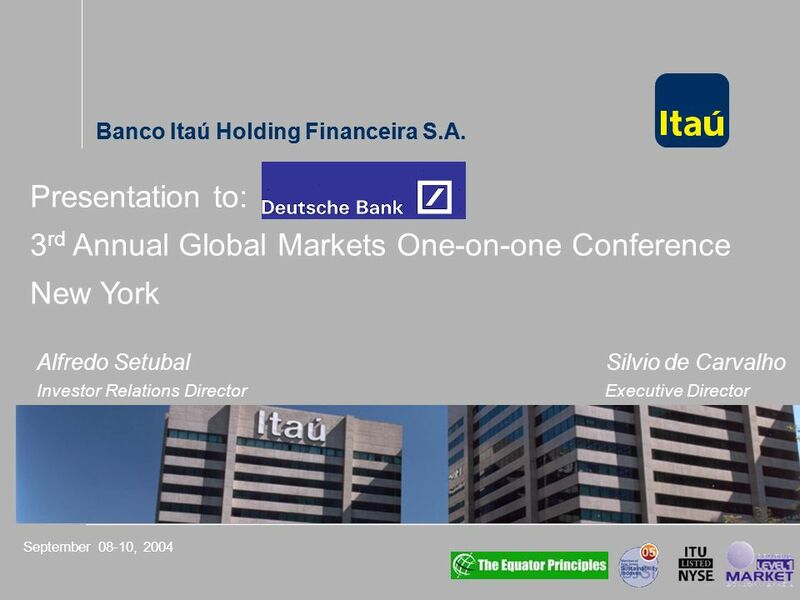 Banco Itaú Holding Financeira S.A. September 08-10, 2004 Presentation to: 3 rd Annual Global Markets One-on-one Conference New York Banco Itaú Holding. 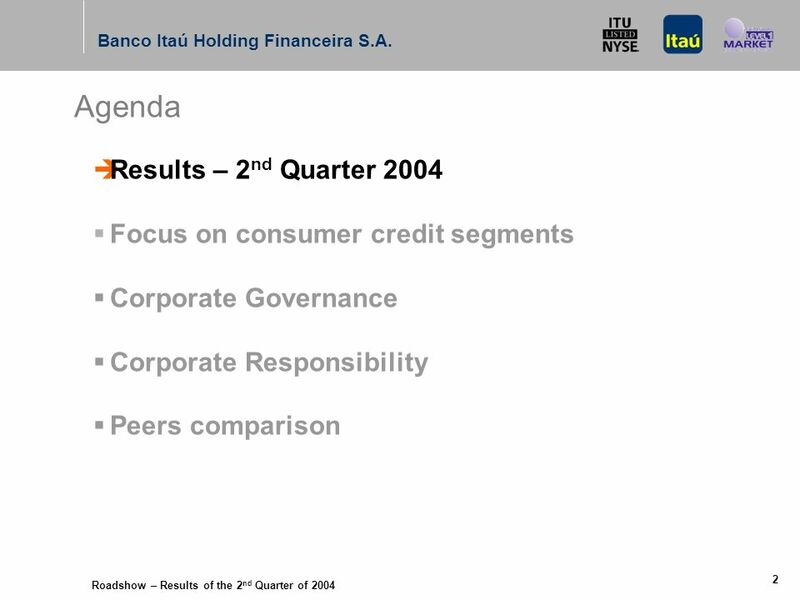 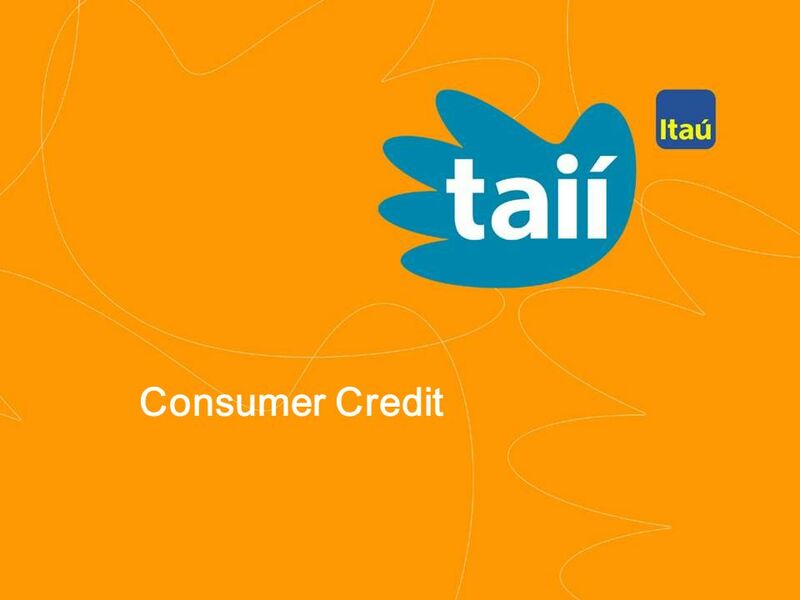 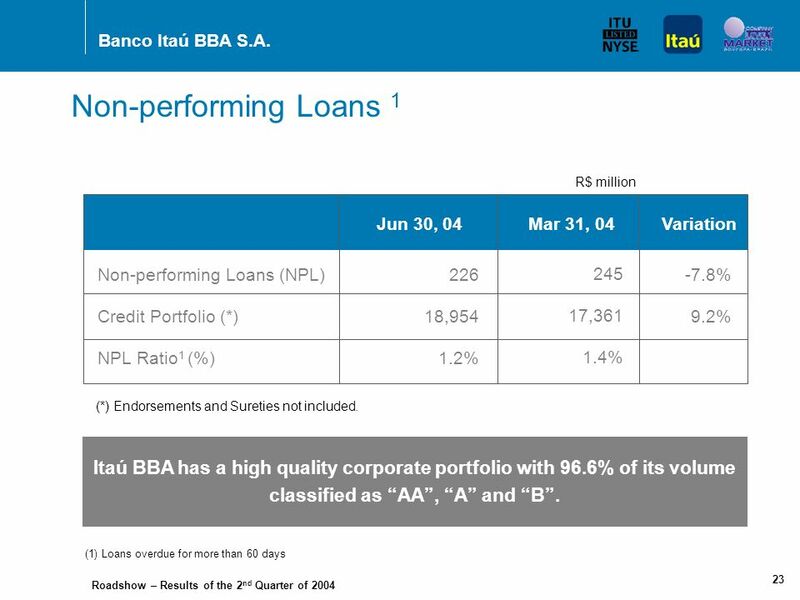 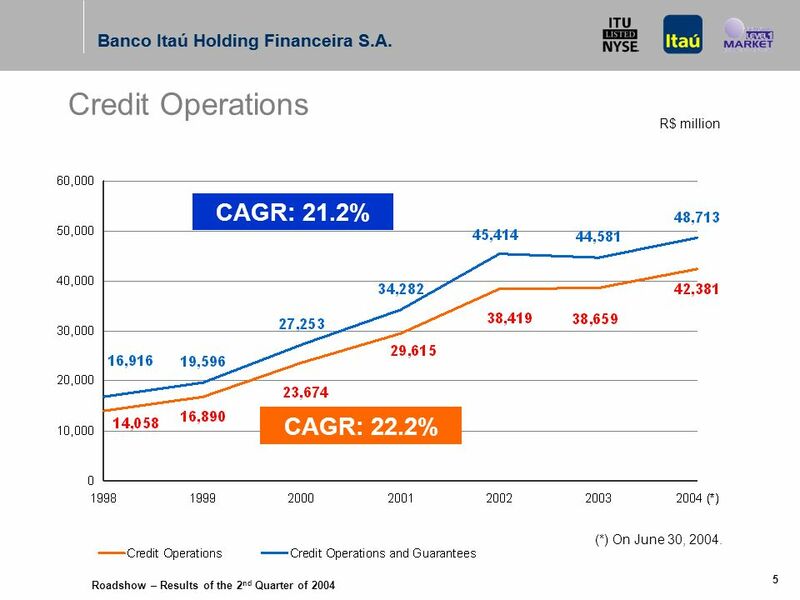 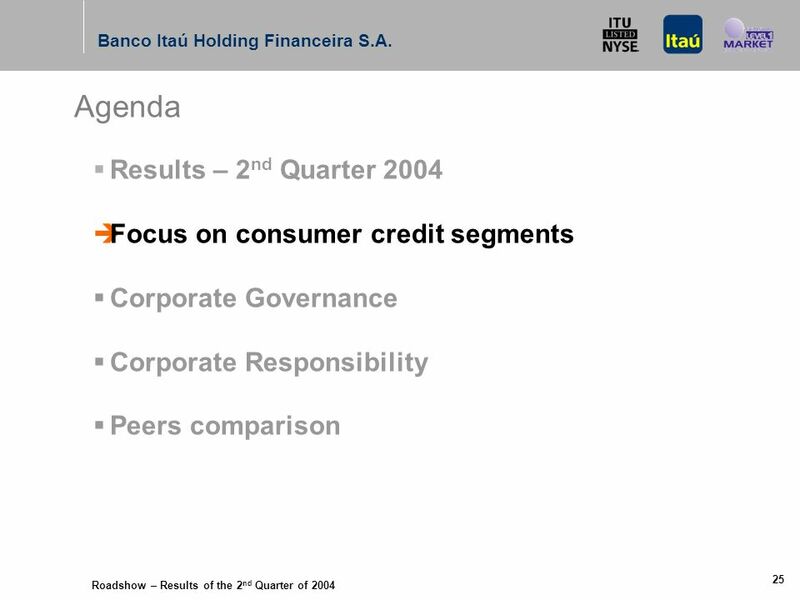 6 Roadshow – Results of the 2 nd Quarter of 2004 Banco Itaú Holding Financeira S.A. 5 Credit Operations R$ million CAGR: 21.2% CAGR: 22.2% (*) On June 30, 2004. 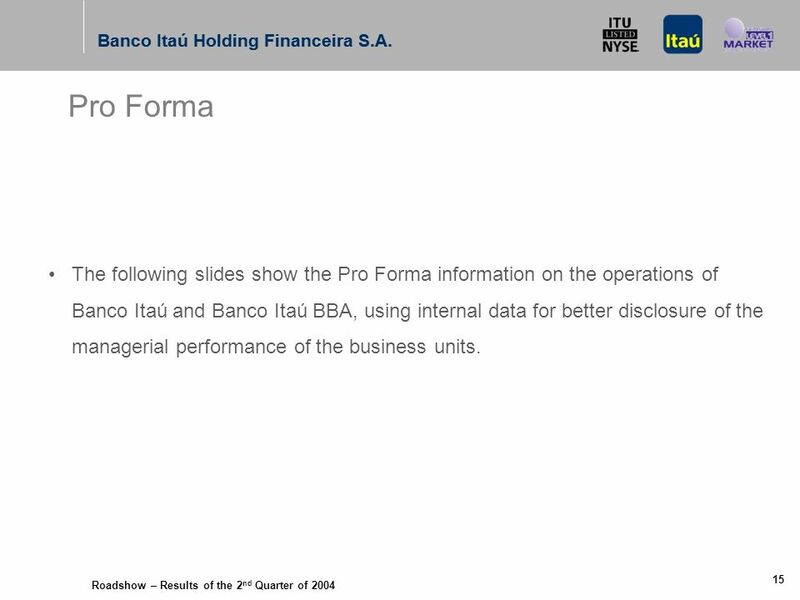 16 Roadshow – Results of the 2 nd Quarter of 2004 Banco Itaú Holding Financeira S.A. 15 The following slides show the Pro Forma information on the operations of Banco Itaú and Banco Itaú BBA, using internal data for better disclosure of the managerial performance of the business units. 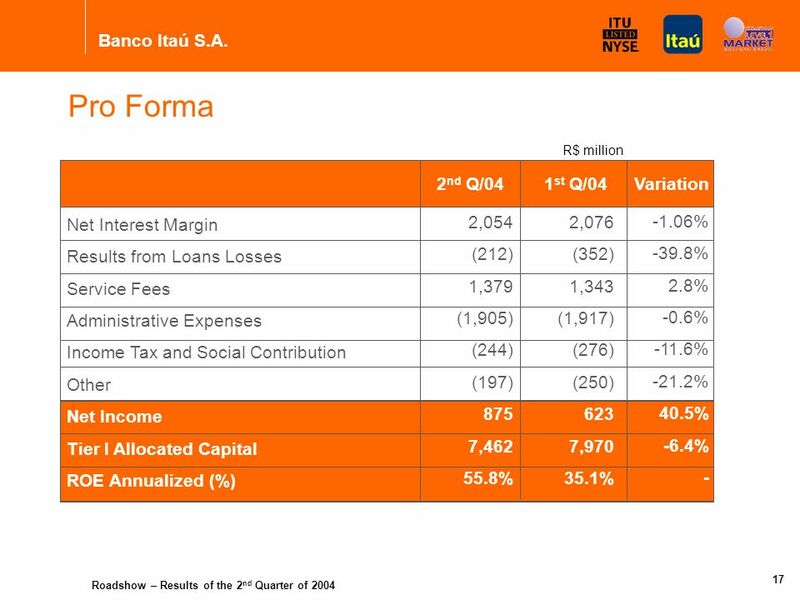 Pro Forma Banco Itaú Holding Financeira S.A.
17 Roadshow – Results of the 2 nd Quarter of 2004 Banco Itaú Holding Financeira S.A. 16 Banco Itaú 875 7,462 55.8% 25,116 97,819 Banco Itaú BBA 195 3,543 24.0% 23,597 36,191 Net Income Tier I Allocated Capital ROE Annualized (%) Credit Portfolio (*) Total Assets Banco Itaú 623 7,970 35.1% 23,096 101,738 Banco Itaú BBA 226 3,394 29.4% 21,660 31,130 2 nd Q/041 st Q/04 (*) Endorsements and Sureties included. 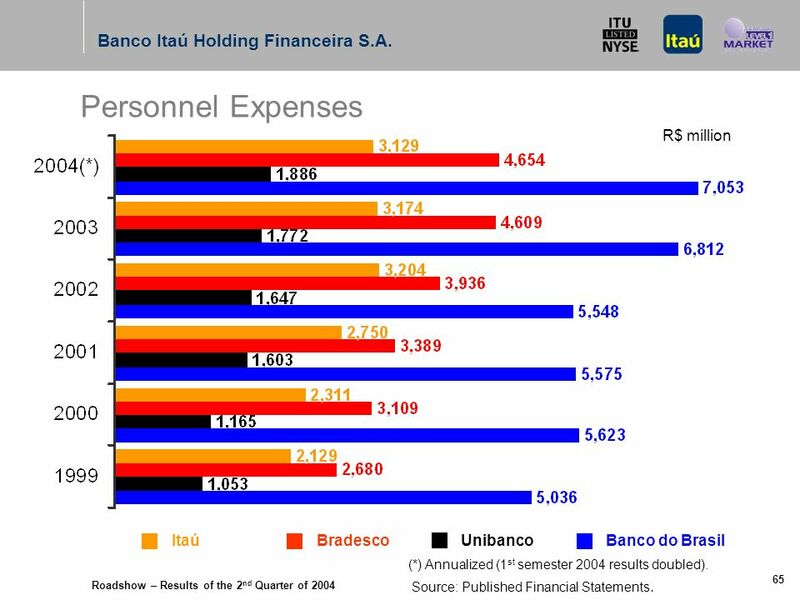 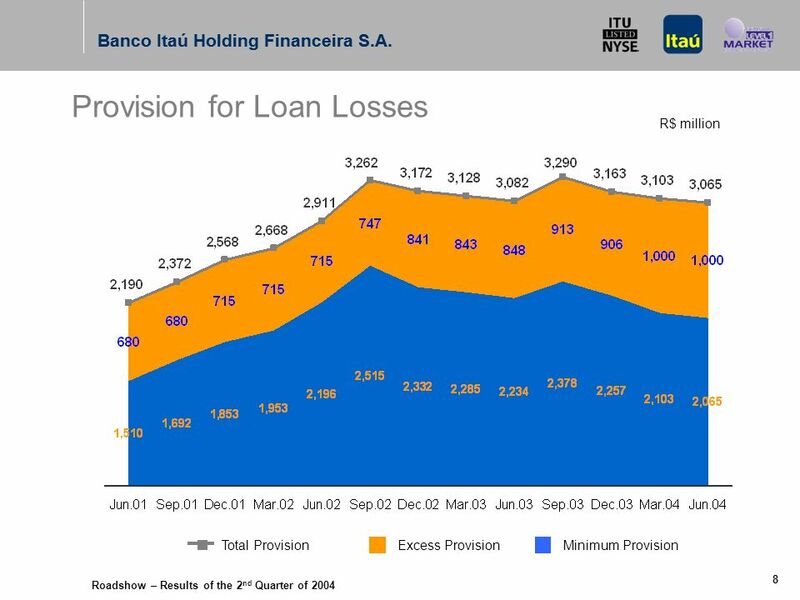 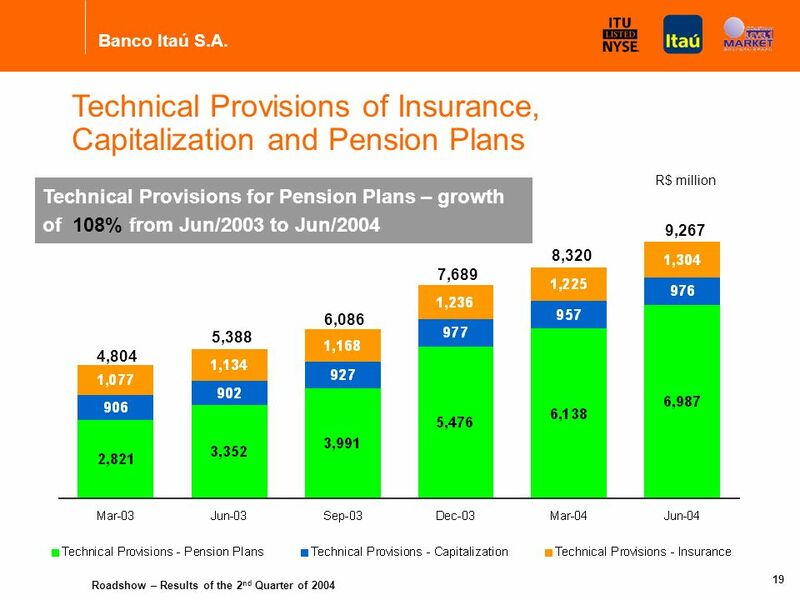 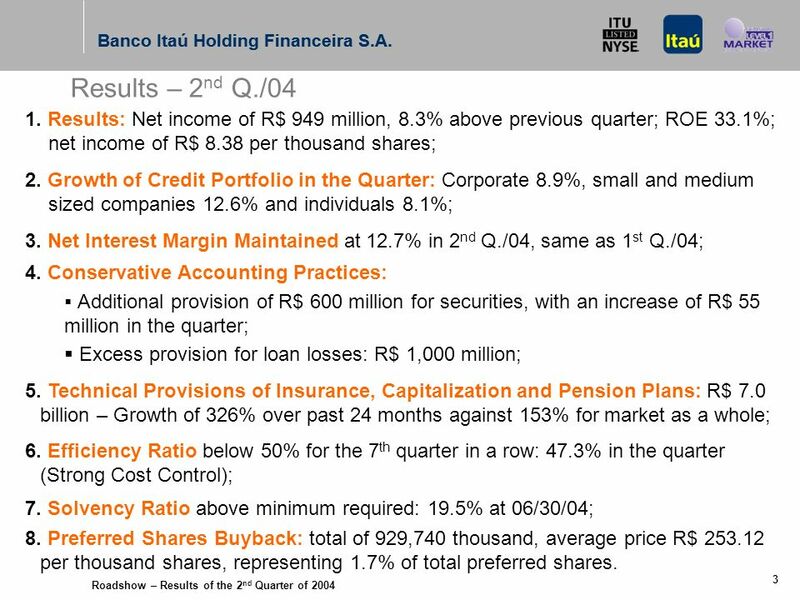 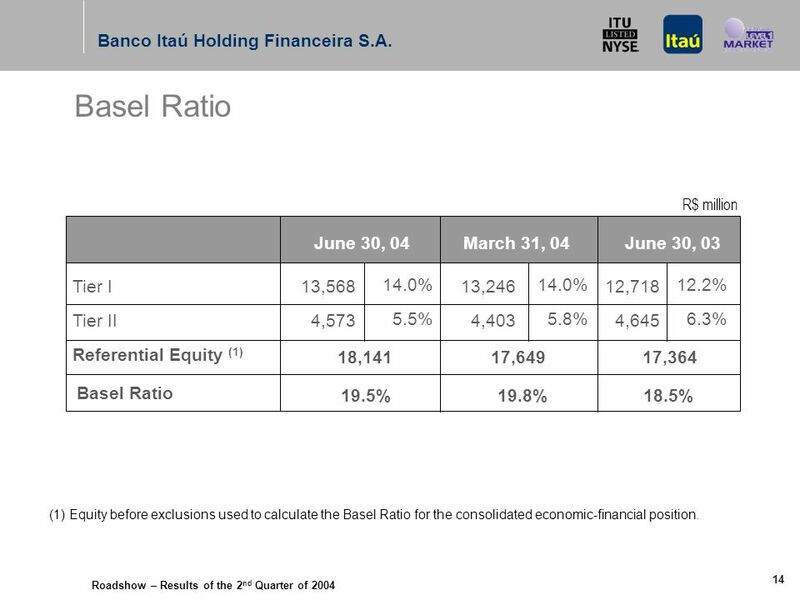 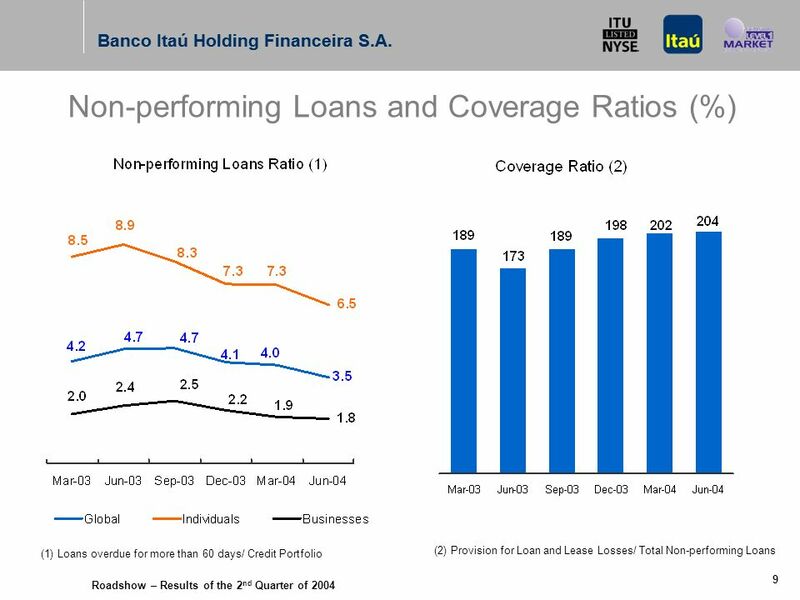 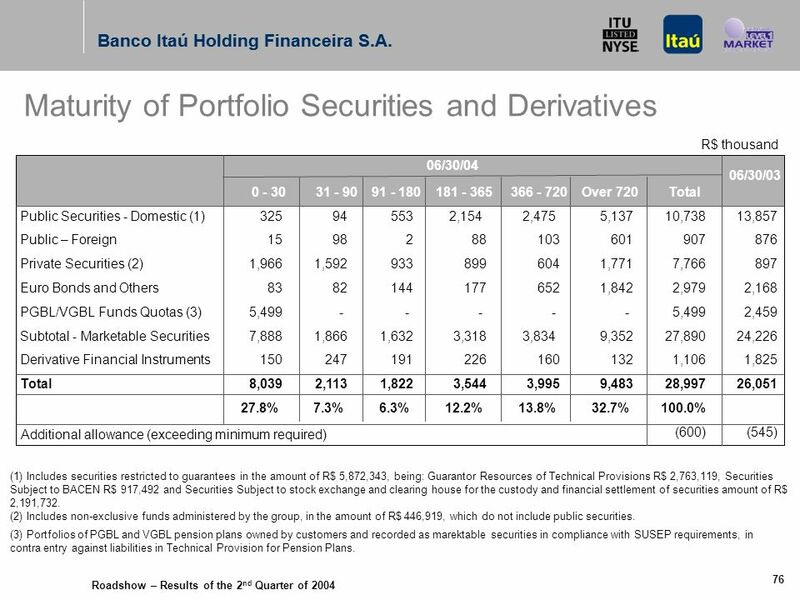 Banco Itaú Holding Financeira S.A. R$ million Pro Forma Corpo- ration 27 1,115 10.1% - 4,764 Corpo- ration (122) 1,783 -24.6% - 5,732 Note: The Consolidated figures do not represent the sum of the parts because certain intercompany transactions were excluded from the consolidated financial statements only. 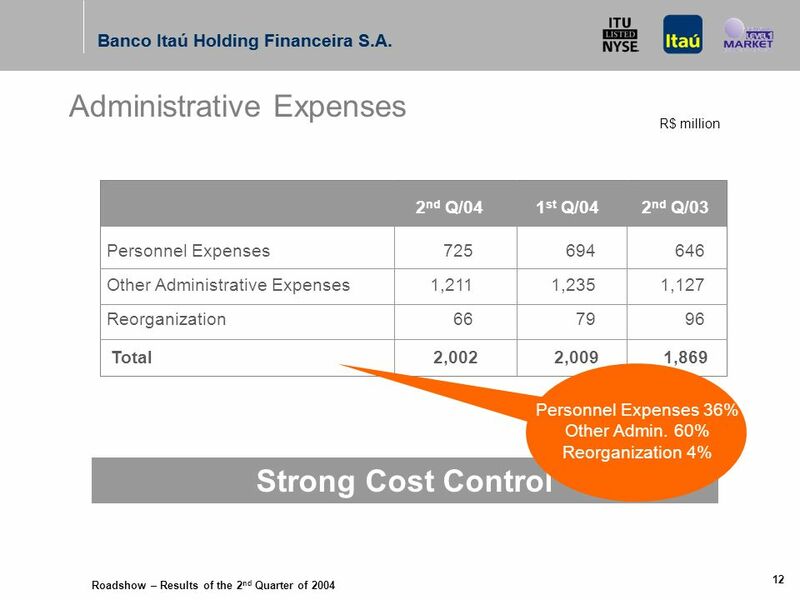 Corporate results are basically affected by the non accounting of tax credits. 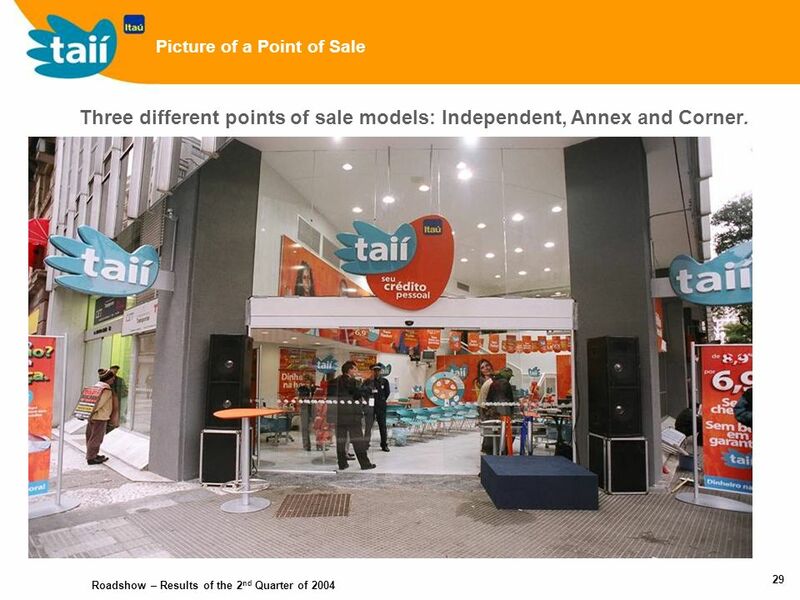 30 Roadshow – Results of the 2 nd Quarter of 2004 29 Picture of a Point of Sale Three different points of sale models: Independent, Annex and Corner. 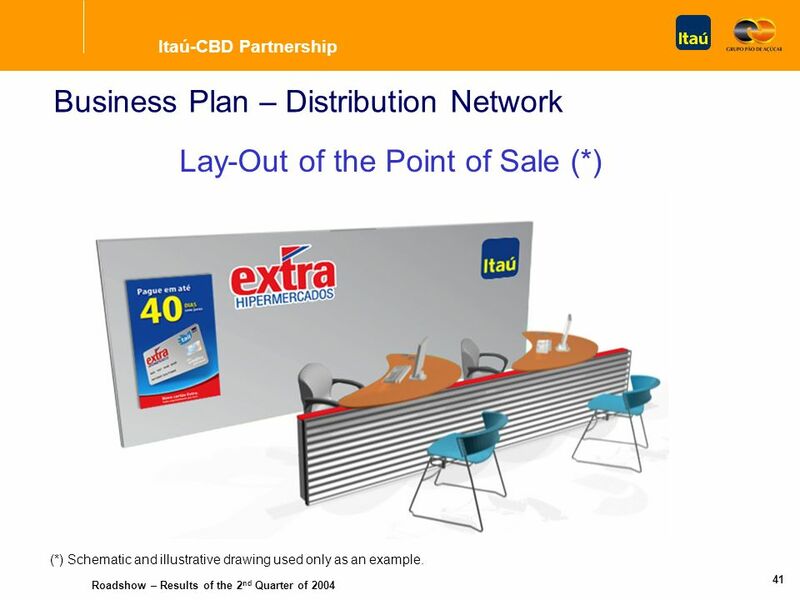 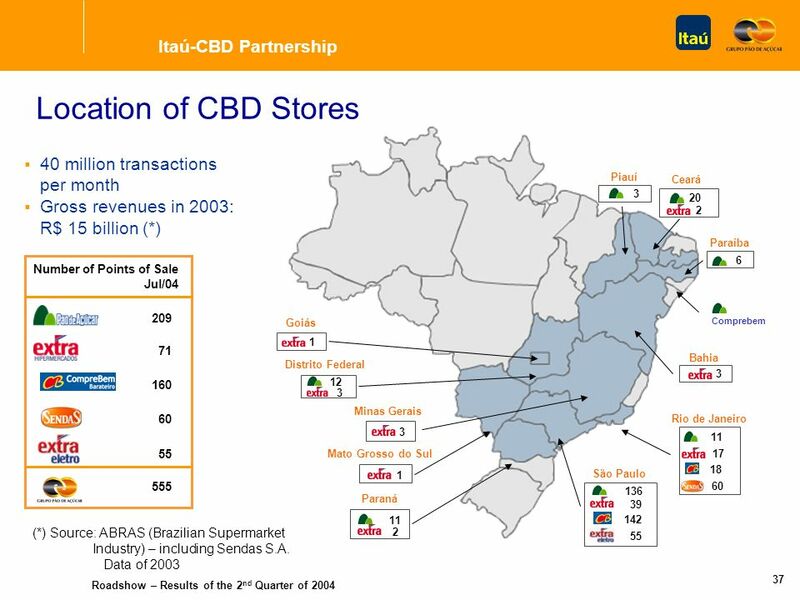 42 Roadshow – Results of the 2 nd Quarter of 2004 41 Itaú-CBD Partnership Business Plan – Distribution Network Lay-Out of the Point of Sale (*) (*) Schematic and illustrative drawing used only as an example. 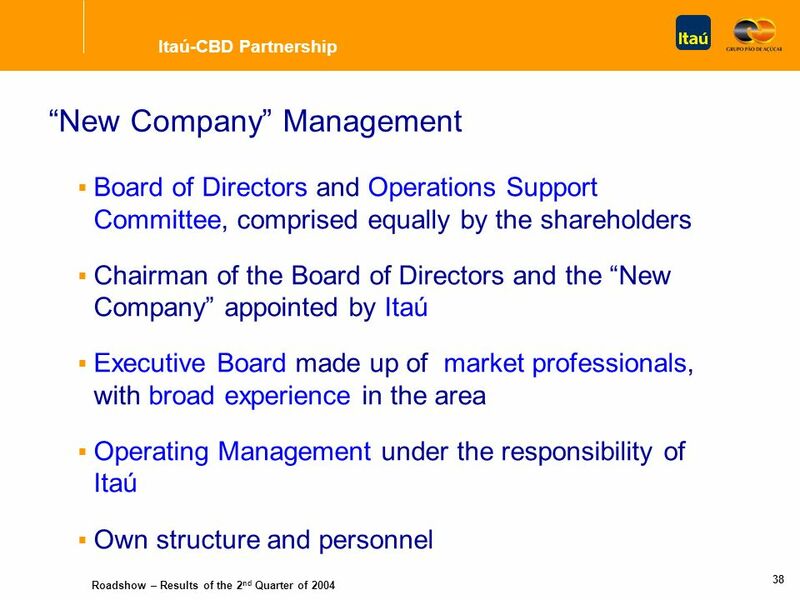 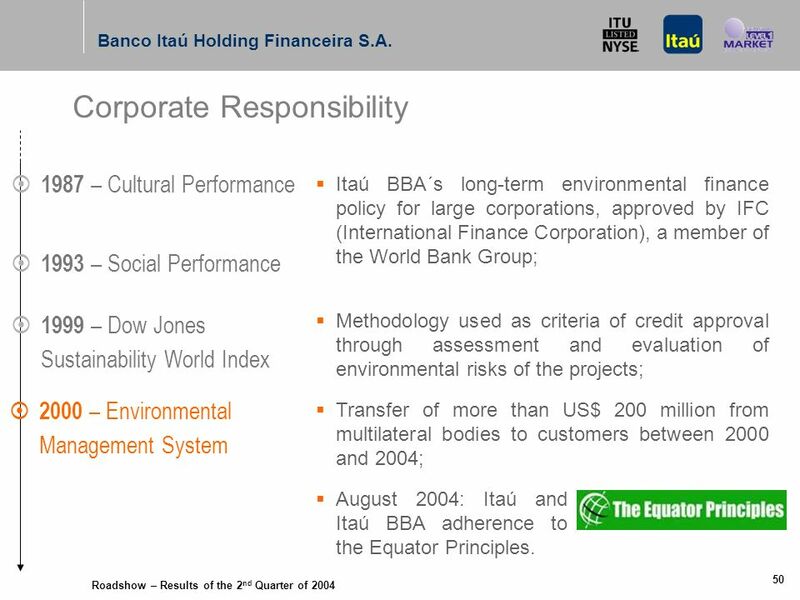 45 Roadshow – Results of the 2 nd Quarter of 2004 Banco Itaú Holding Financeira S.A. 44 Audit Committee installed in April 2004; All three members also sit on the Board of Directors; Independent Board member Tereza Grossi appointed Financial Expert of the Audit Committee. 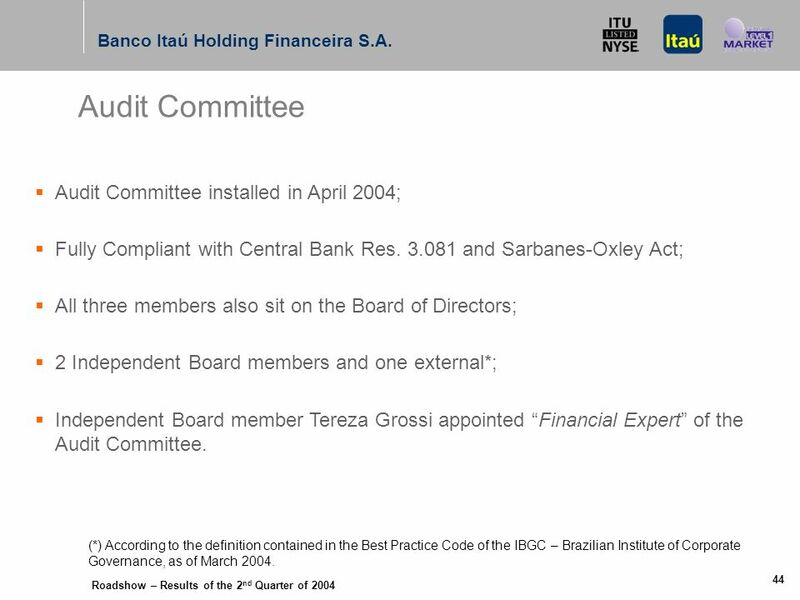 Audit Committee 2 Independent Board members and one external*; Fully Compliant with Central Bank Res. 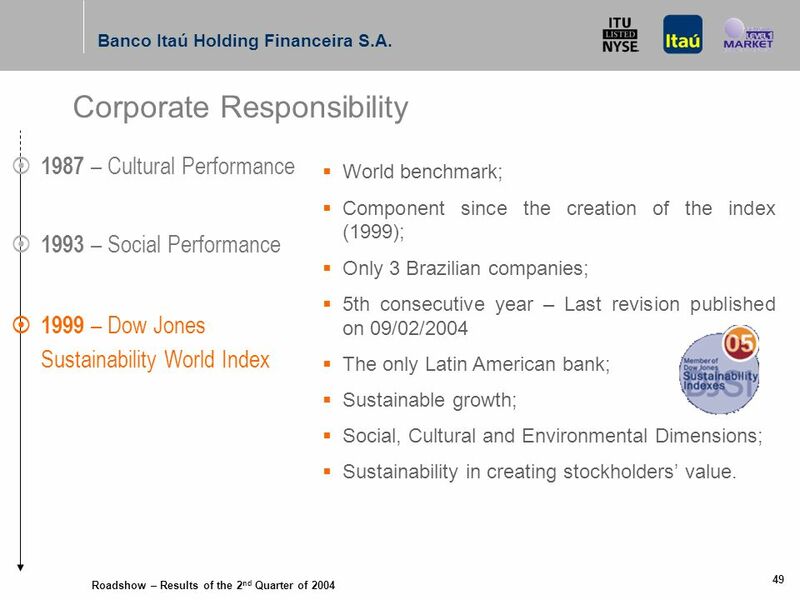 3.081 and Sarbanes-Oxley Act; (*) According to the definition contained in the Best Practice Code of the IBGC – Brazilian Institute of Corporate Governance, as of March 2004. 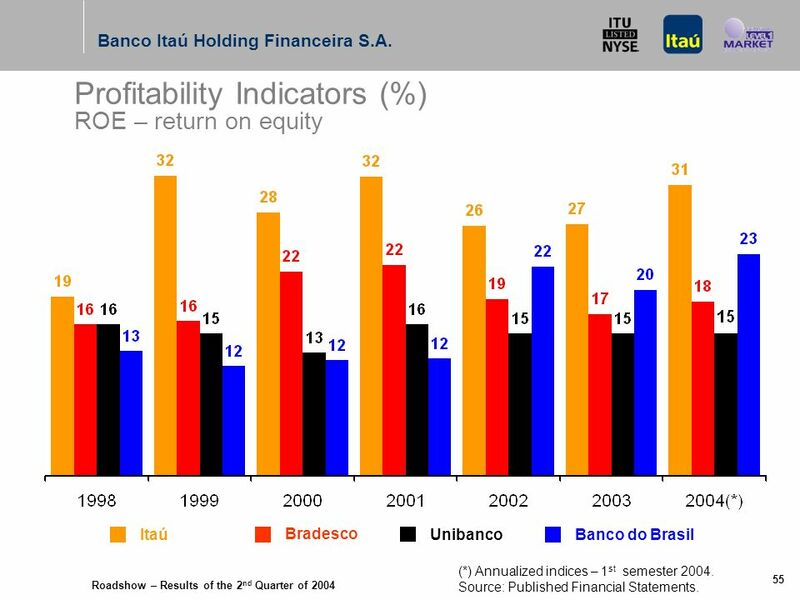 56 Roadshow – Results of the 2 nd Quarter of 2004 Banco Itaú Holding Financeira S.A. 55 Profitability Indicators (%) ROE – return on equity Itaú Bradesco UnibancoBanco do Brasil (*) Annualized indices – 1 st semester 2004. 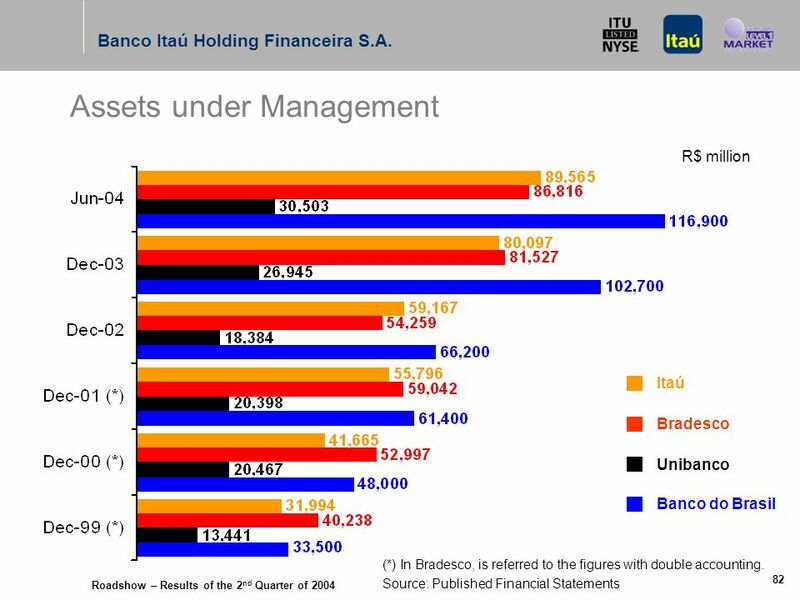 Source: Published Financial Statements. 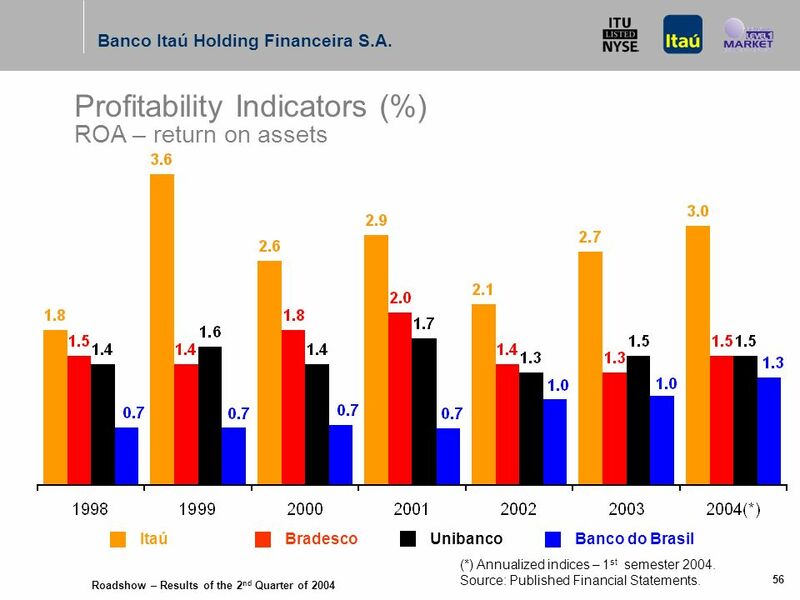 57 Roadshow – Results of the 2 nd Quarter of 2004 Banco Itaú Holding Financeira S.A. 56 Itaú Bradesco UnibancoBanco do Brasil Profitability Indicators (%) ROA – return on assets (*) Annualized indices – 1 st semester 2004. 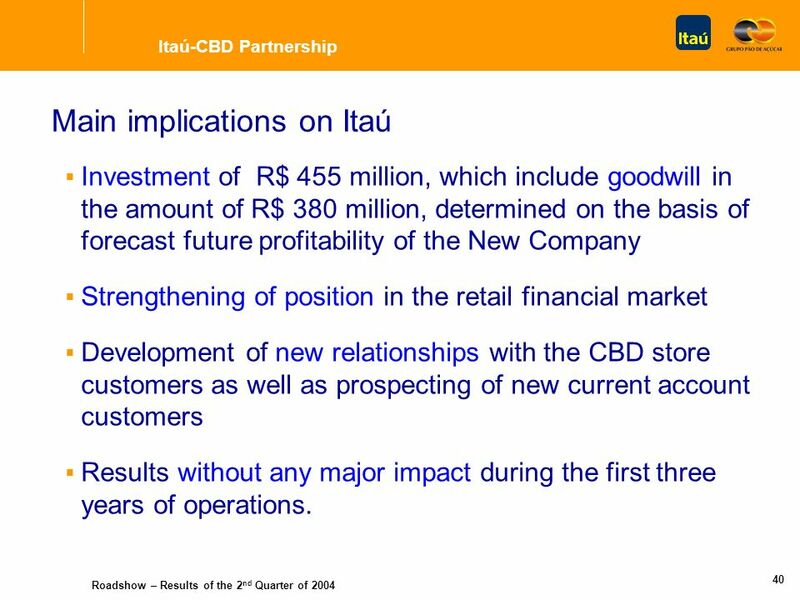 Source: Published Financial Statements. 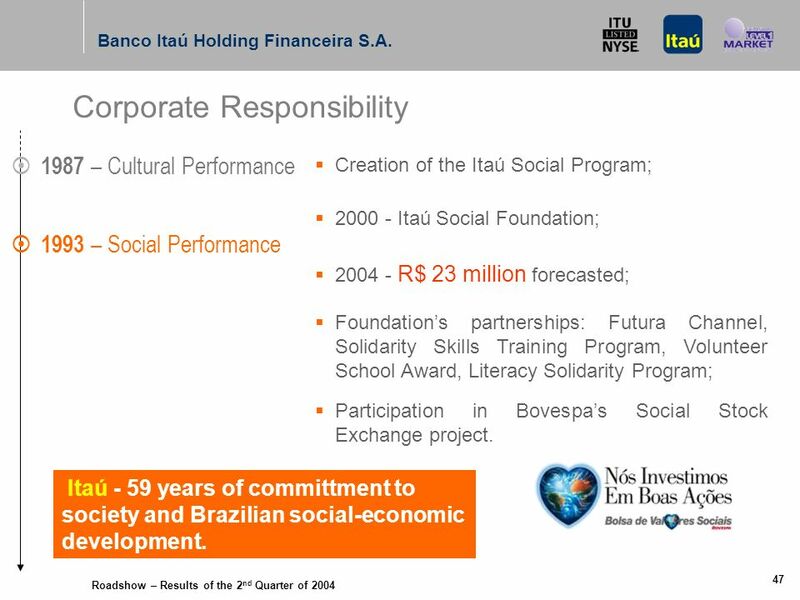 58 Roadshow – Results of the 2 nd Quarter of 2004 Banco Itaú Holding Financeira S.A. 57 Net Income R$ million Itaú Bradesco UnibancoBanco do Brasil (*) Annualized (1 st semester 2004 results doubled). 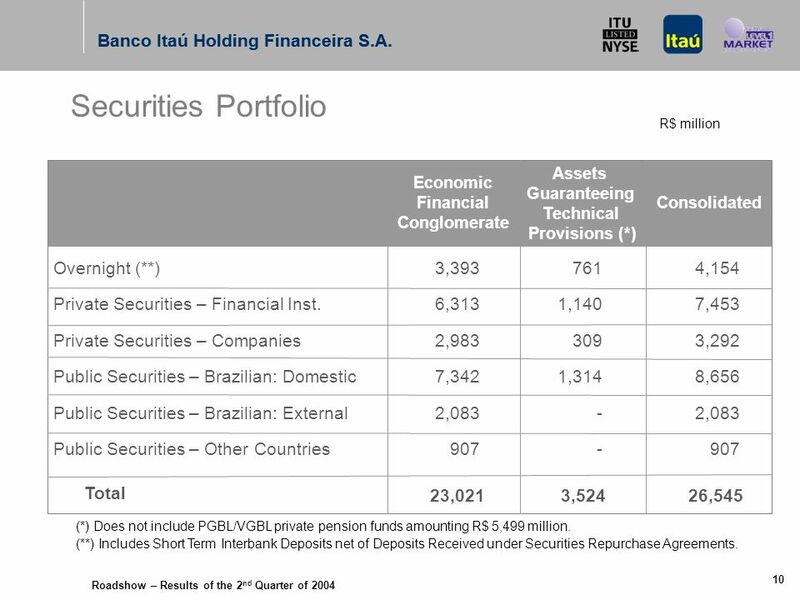 Source: Published Financial Statements. 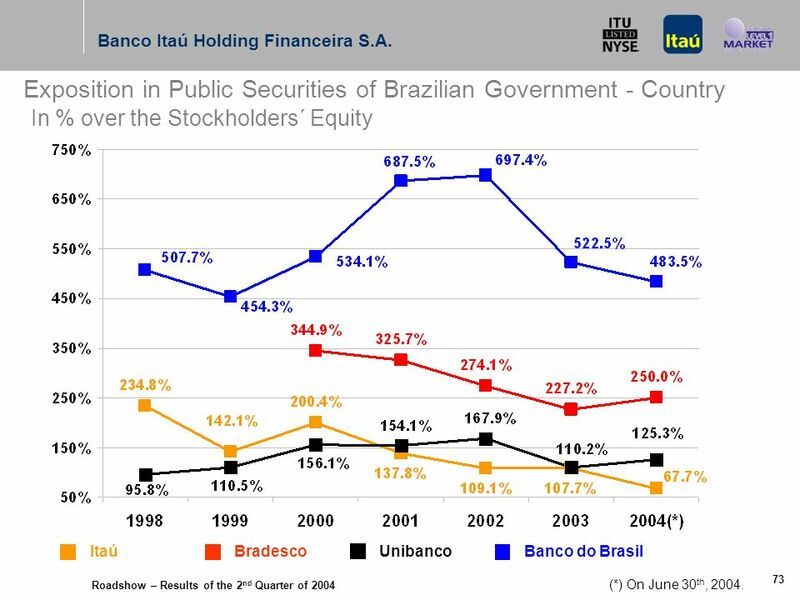 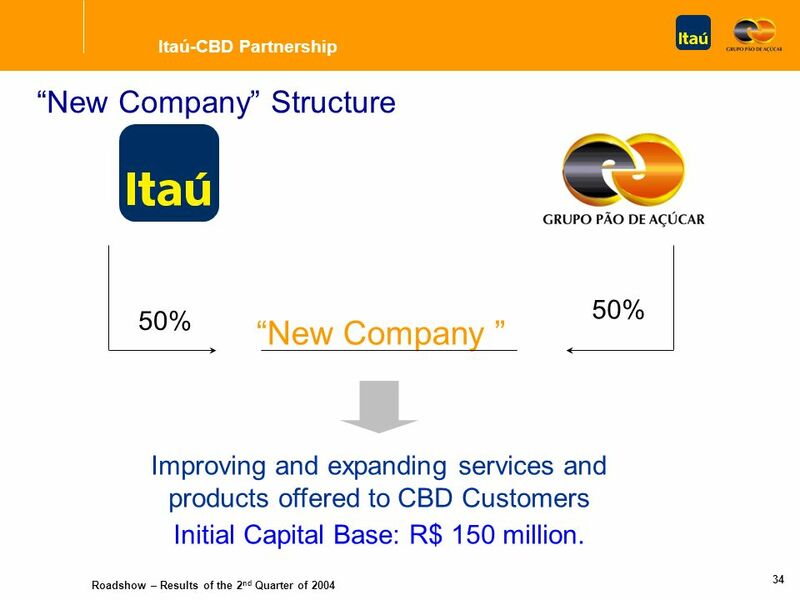 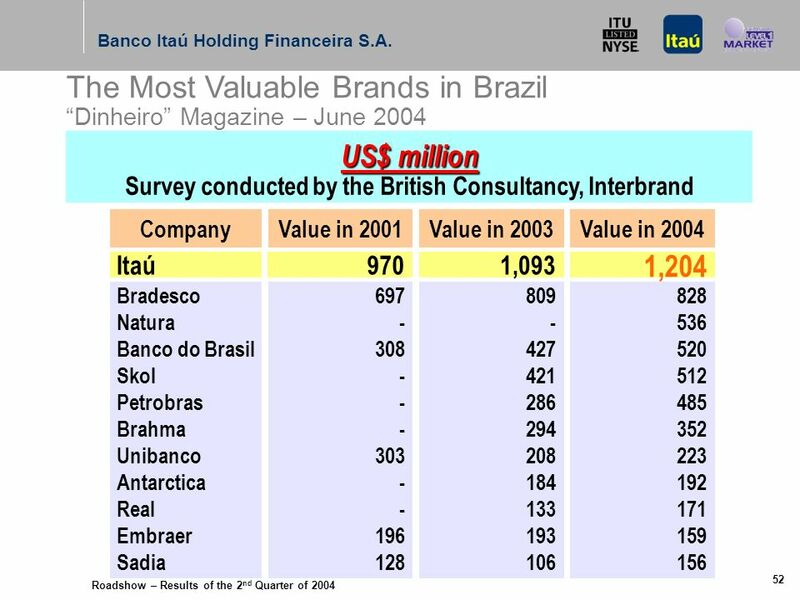 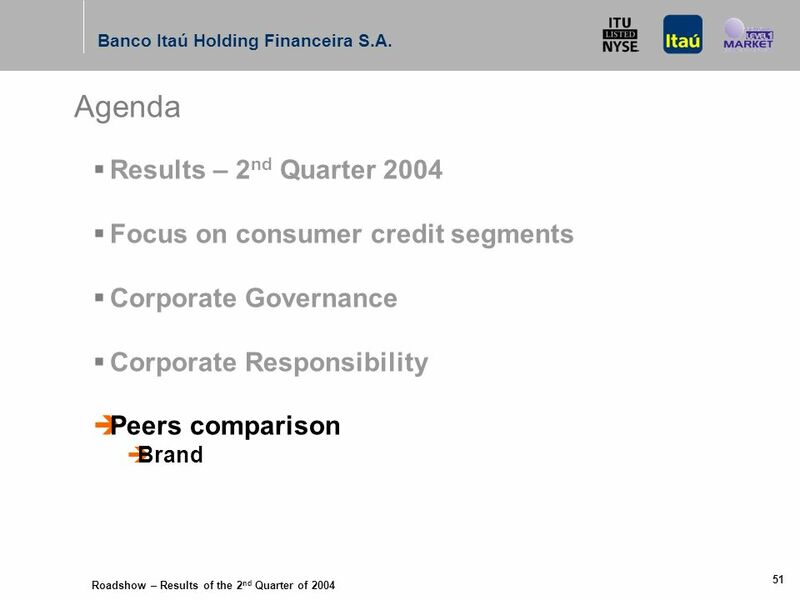 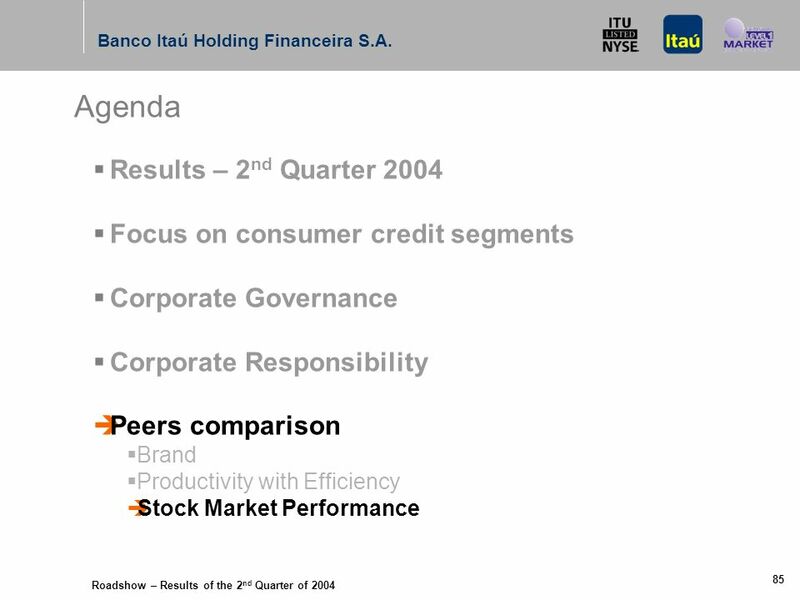 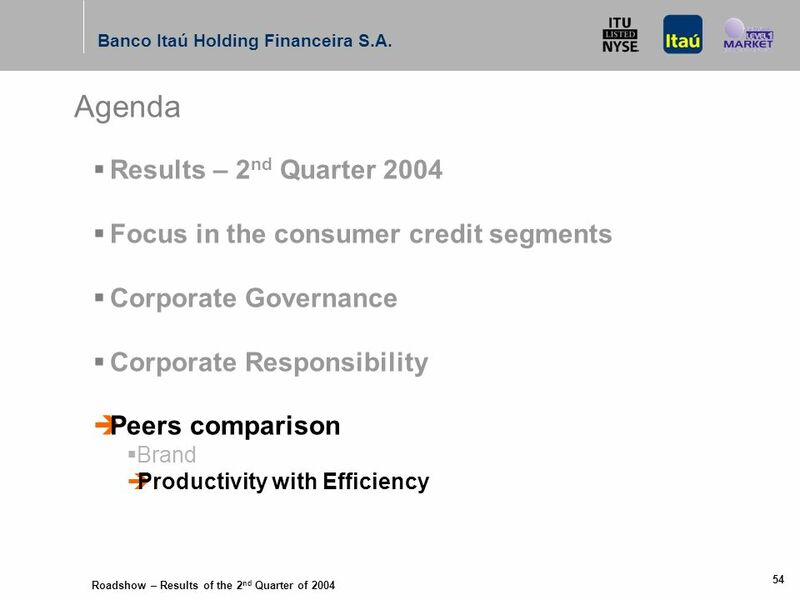 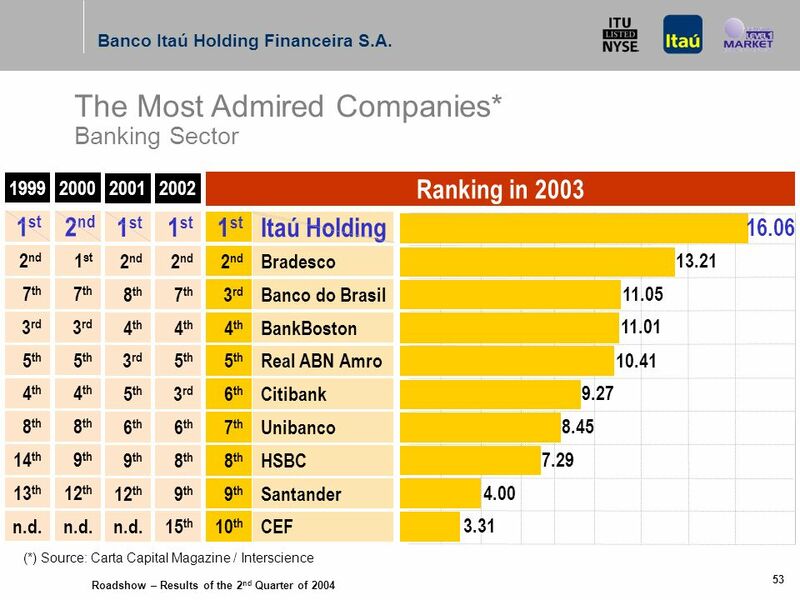 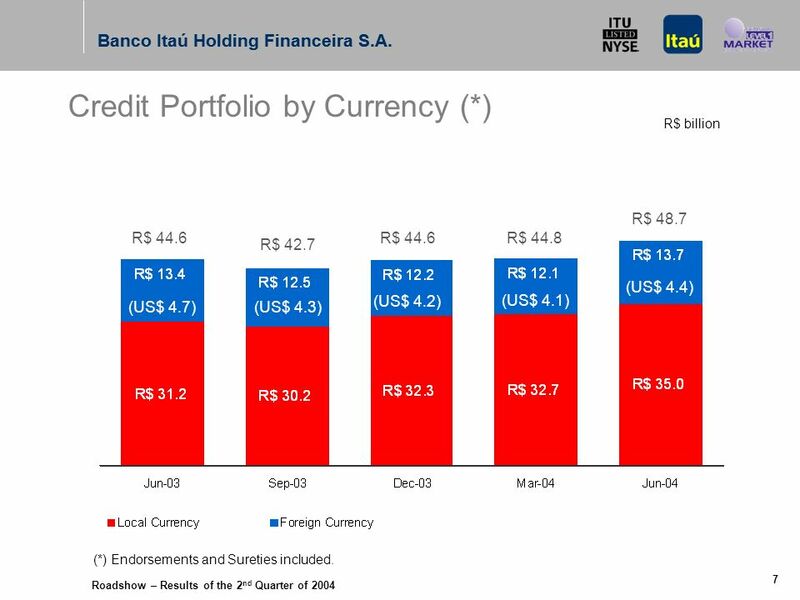 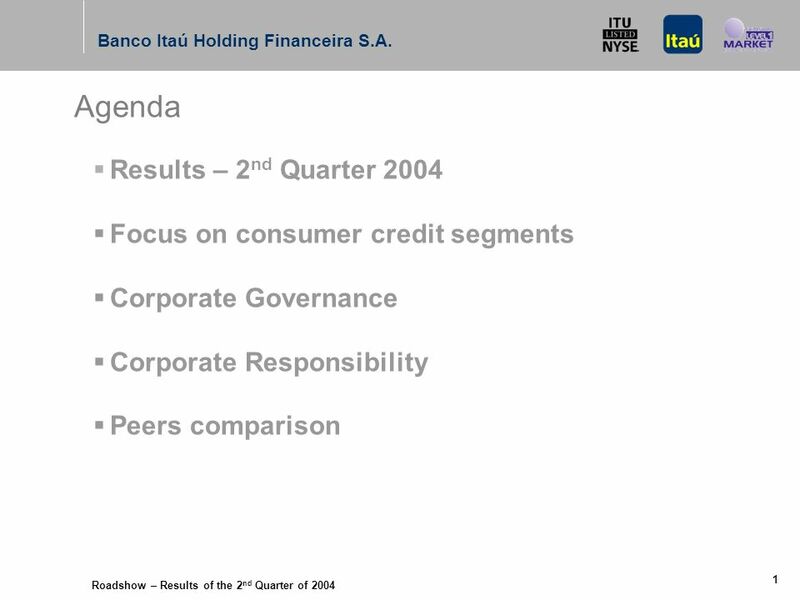 59 Roadshow – Results of the 2 nd Quarter of 2004 Banco Itaú Holding Financeira S.A. 58 Number of Branches + CSBs 1 quantity Itaú Bradesco UnibancoBanco do Brasil (1) CSB: Customer-Site Branch Source: Published Financial Statements. 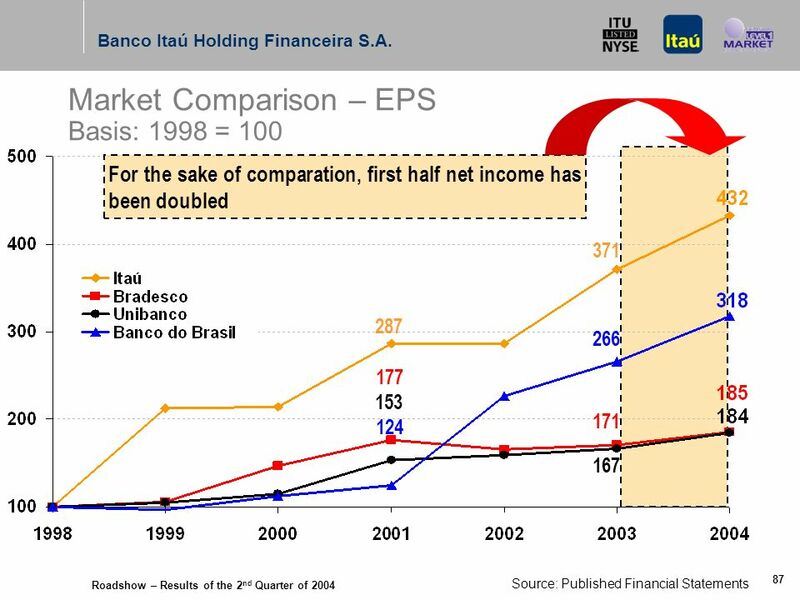 61 Roadshow – Results of the 2 nd Quarter of 2004 Banco Itaú Holding Financeira S.A. 60 Net Income per Employee R$ thousands Itaú Bradesco UnibancoBanco do Brasil (*) Annualized (1 st semester 2004 results doubled). 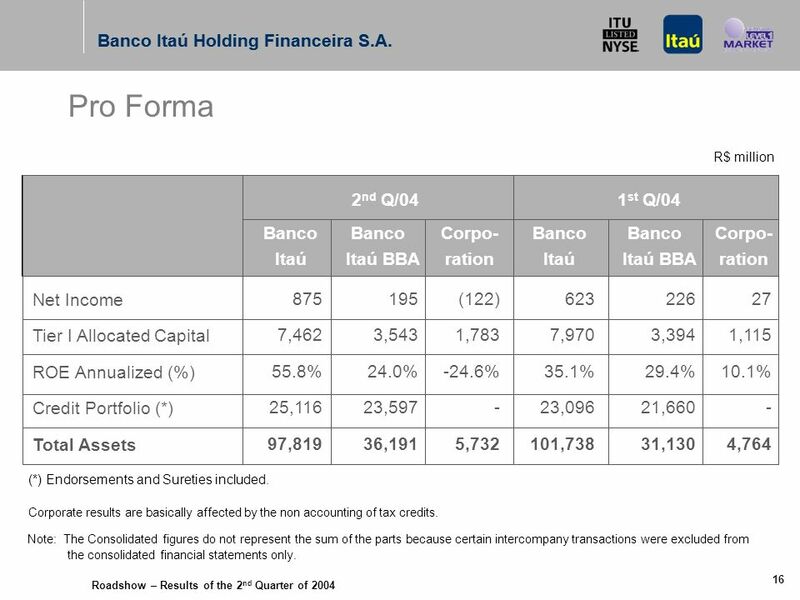 Source: Published Financial Statements. 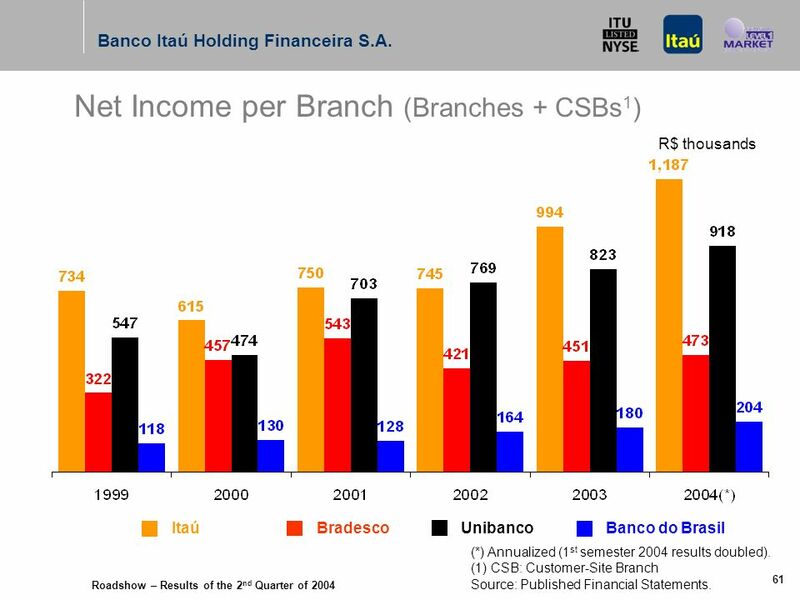 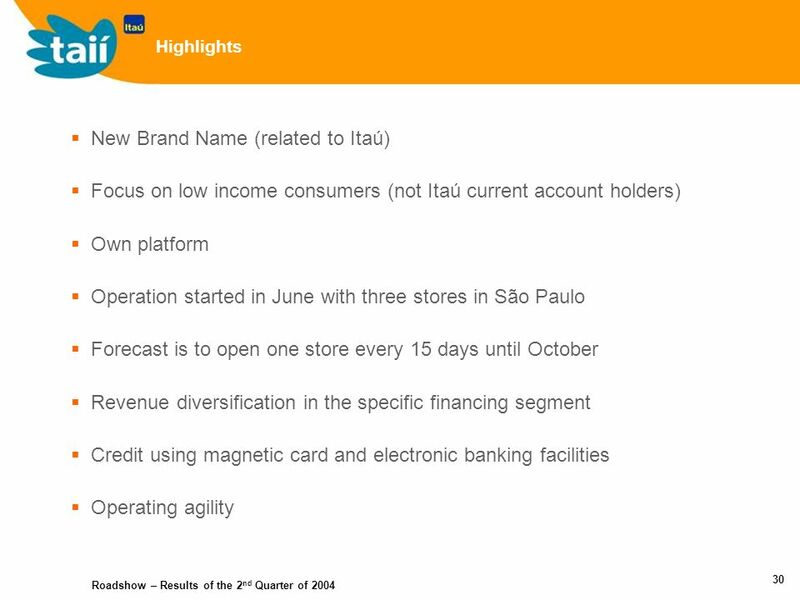 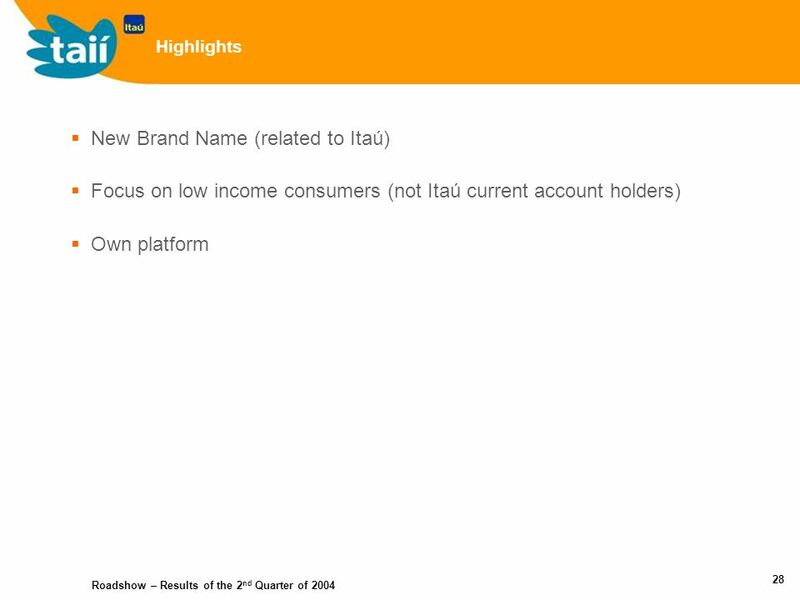 62 Roadshow – Results of the 2 nd Quarter of 2004 Banco Itaú Holding Financeira S.A. 61 R$ thousands Net Income per Branch (Branches + CSBs 1 ) Itaú Bradesco UnibancoBanco do Brasil (*) Annualized (1 st semester 2004 results doubled). 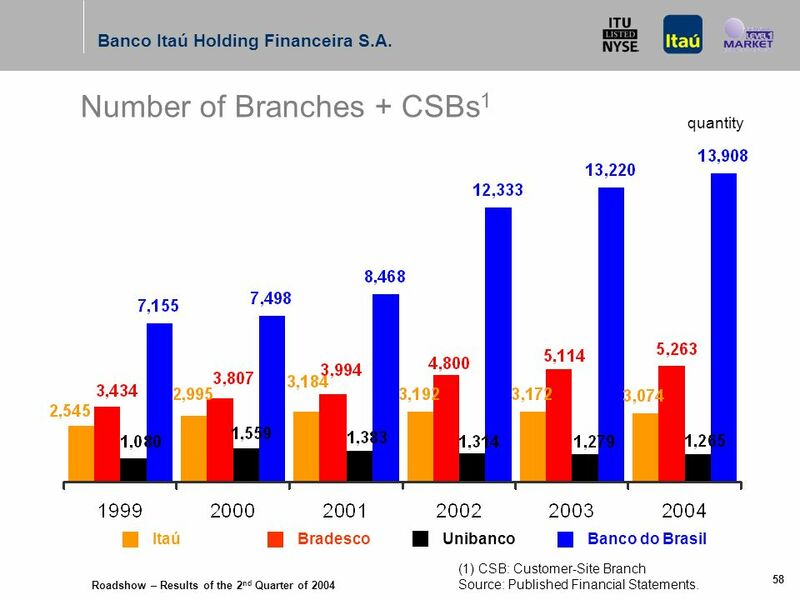 (1) CSB: Customer-Site Branch Source: Published Financial Statements. 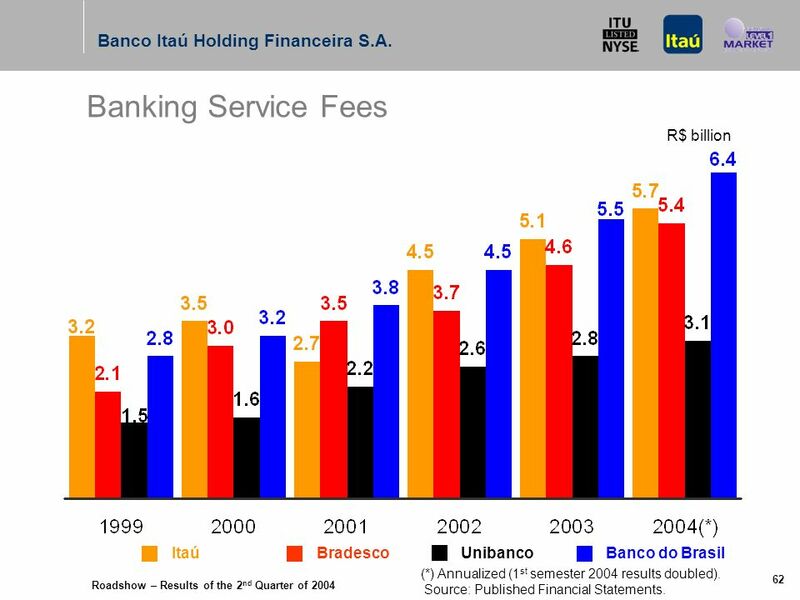 63 Roadshow – Results of the 2 nd Quarter of 2004 Banco Itaú Holding Financeira S.A. 62 Banking Service Fees R$ billion Itaú Bradesco UnibancoBanco do Brasil (*) Annualized (1 st semester 2004 results doubled). 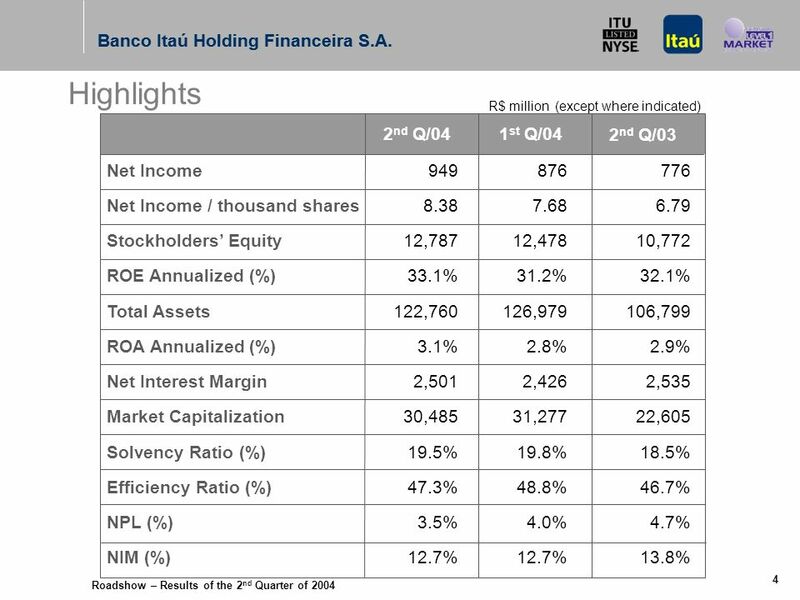 Source: Published Financial Statements. 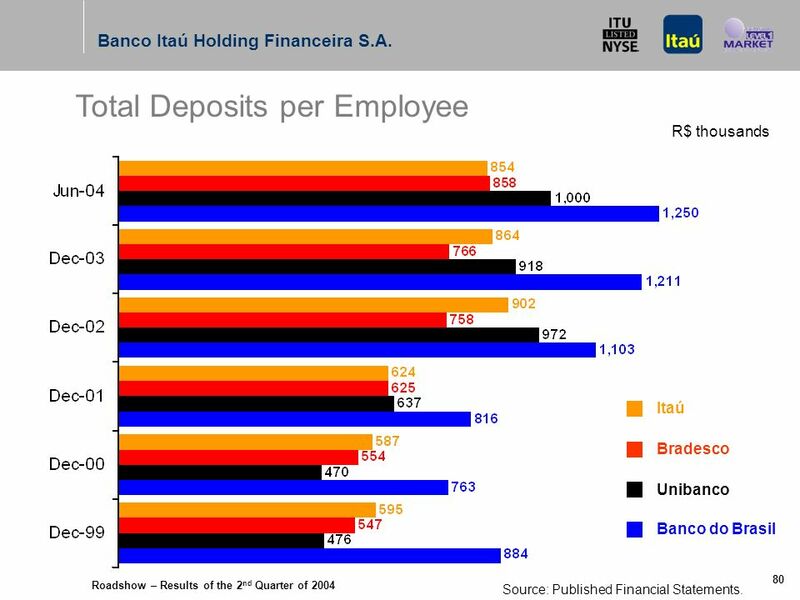 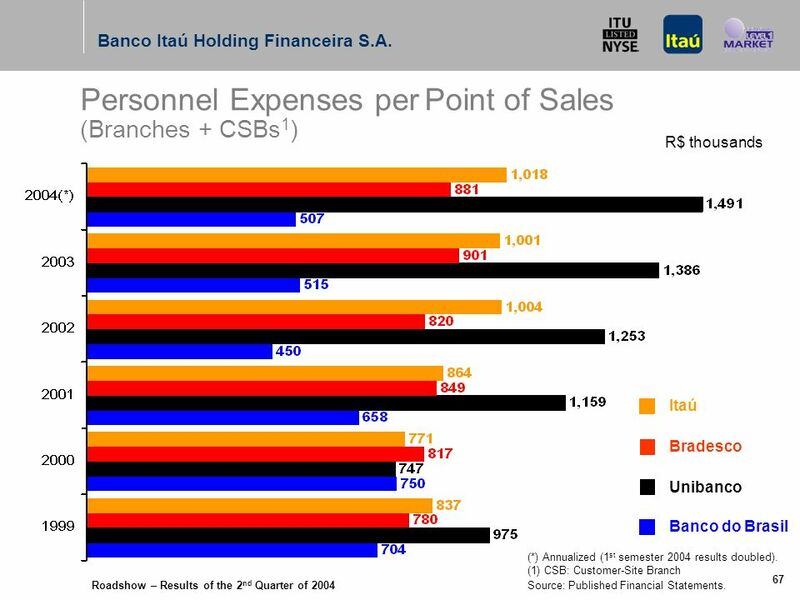 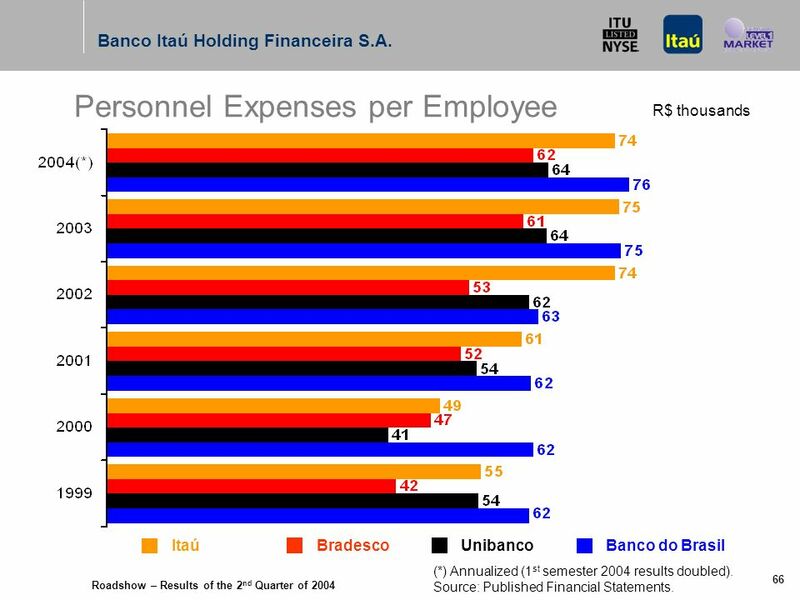 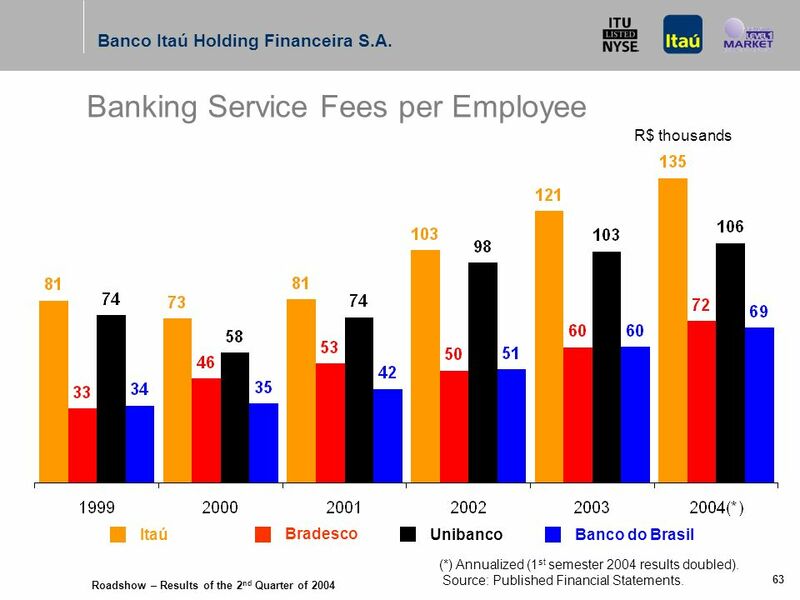 64 Roadshow – Results of the 2 nd Quarter of 2004 Banco Itaú Holding Financeira S.A. 63 Itaú Bradesco UnibancoBanco do Brasil Banking Service Fees per Employee R$ thousands (*) Annualized (1 st semester 2004 results doubled). 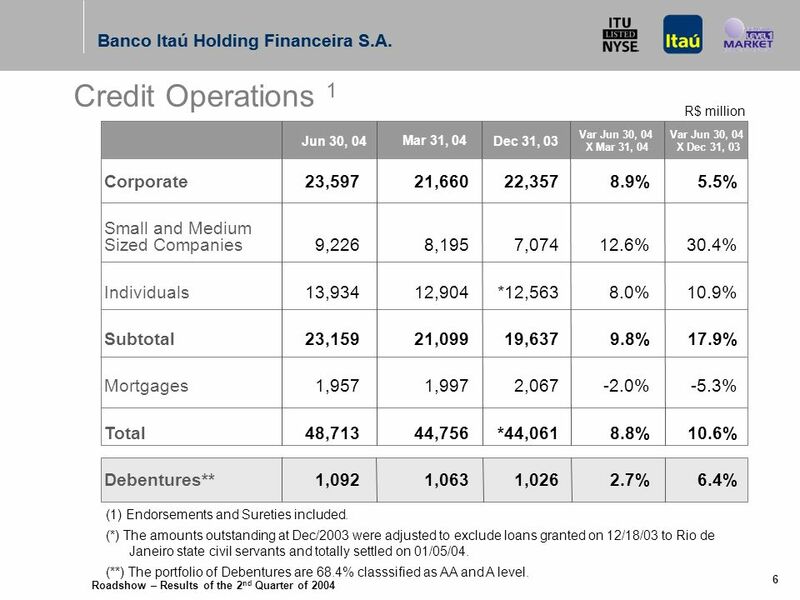 Source: Published Financial Statements. 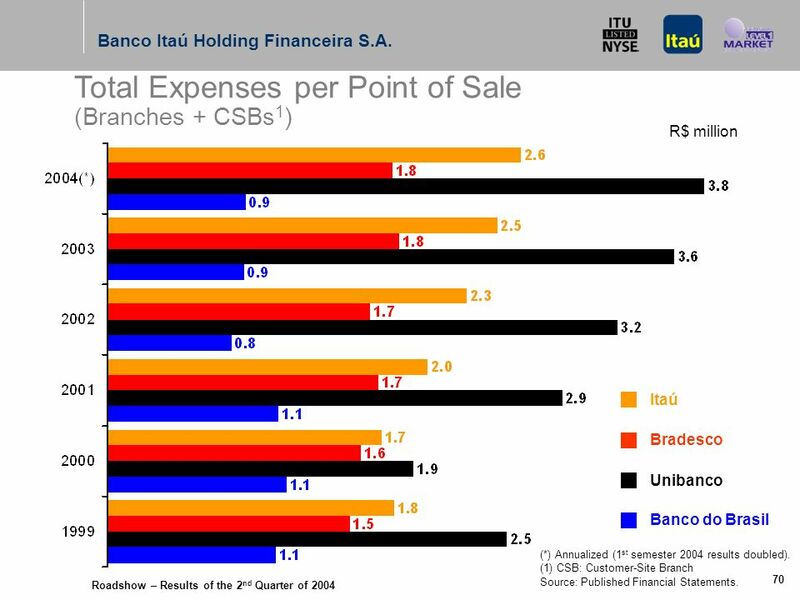 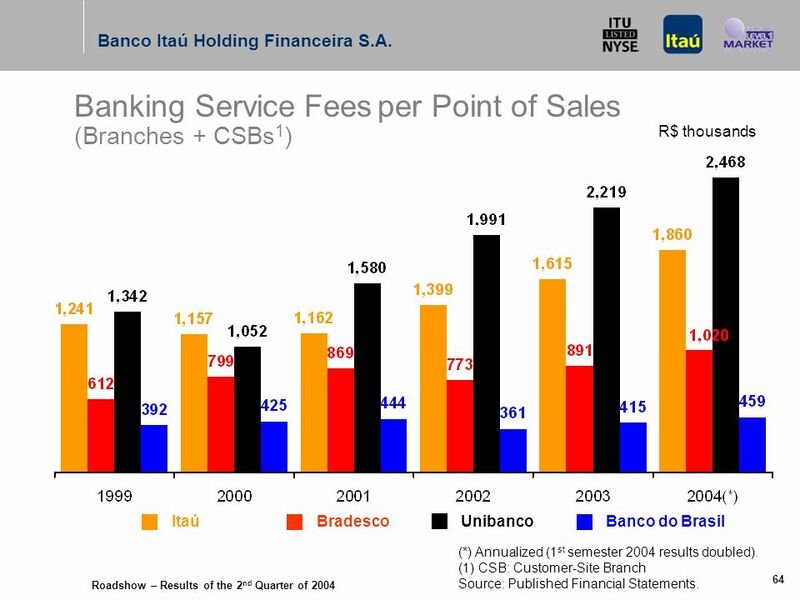 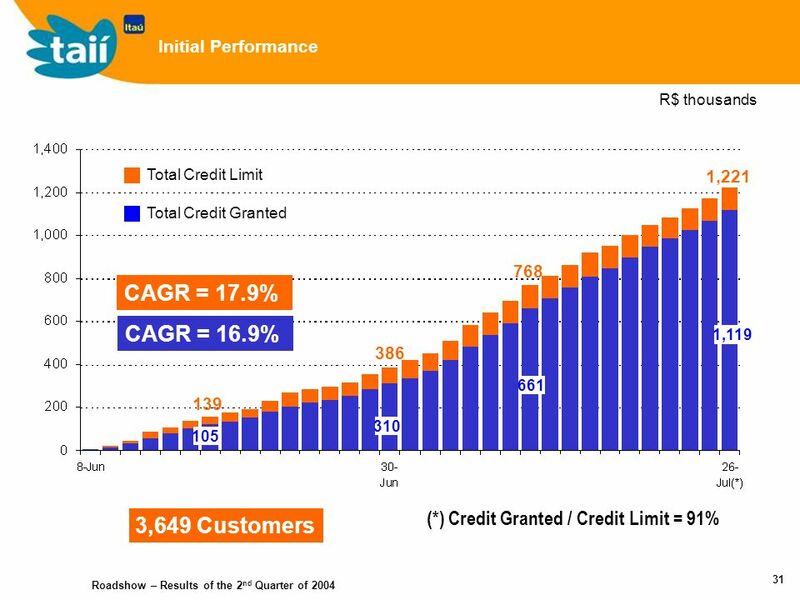 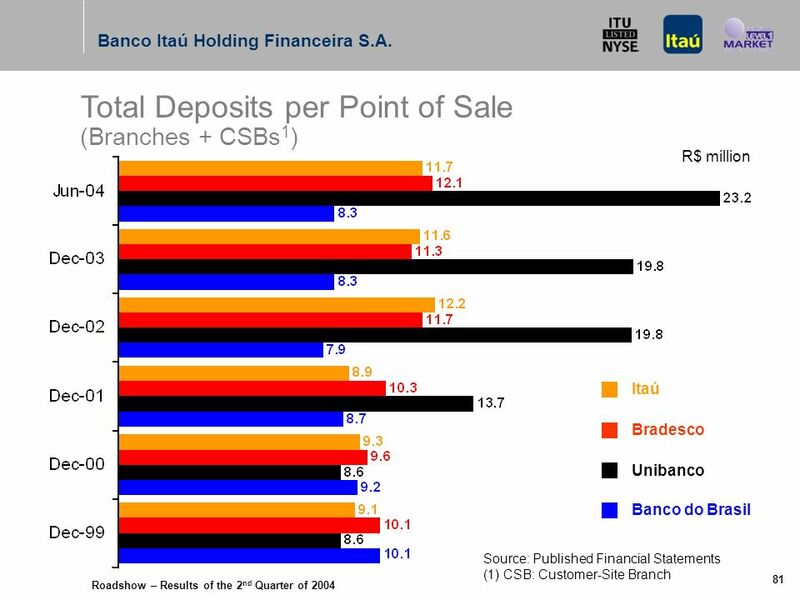 65 Roadshow – Results of the 2 nd Quarter of 2004 Banco Itaú Holding Financeira S.A. 64 Itaú Bradesco UnibancoBanco do Brasil R$ thousands Banking Service Fees per Point of Sales (Branches + CSBs 1 ) (*) Annualized (1 st semester 2004 results doubled). 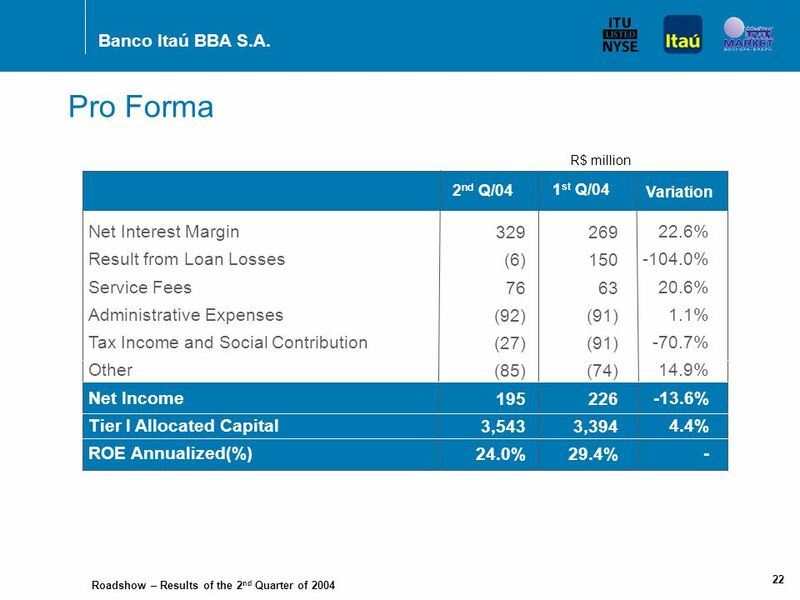 (1) CSB: Customer-Site Branch Source: Published Financial Statements. 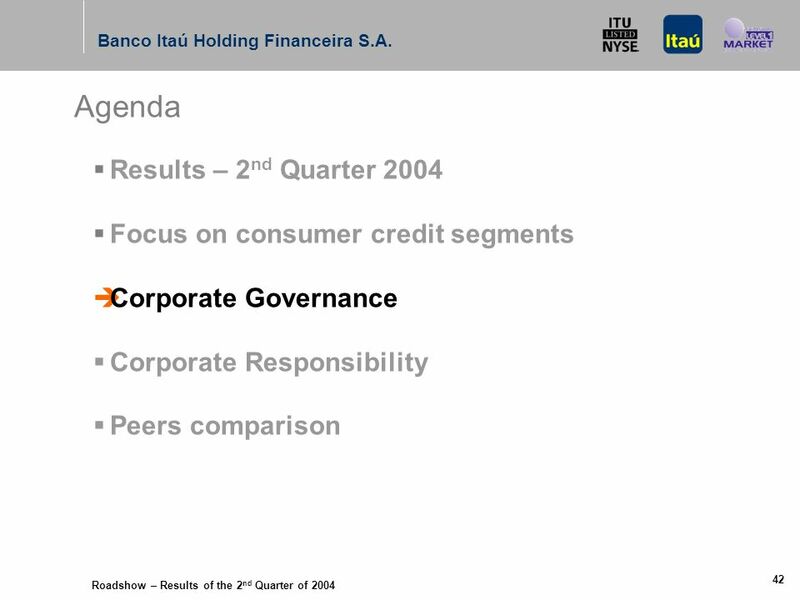 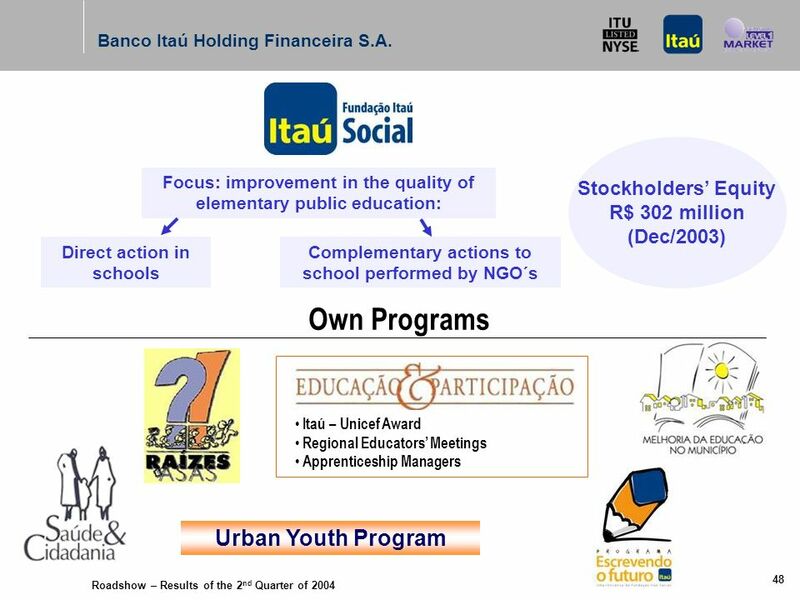 66 Roadshow – Results of the 2 nd Quarter of 2004 Banco Itaú Holding Financeira S.A. 65 Personnel Expenses R$ million Itaú Bradesco UnibancoBanco do Brasil (*) Annualized (1 st semester 2004 results doubled). 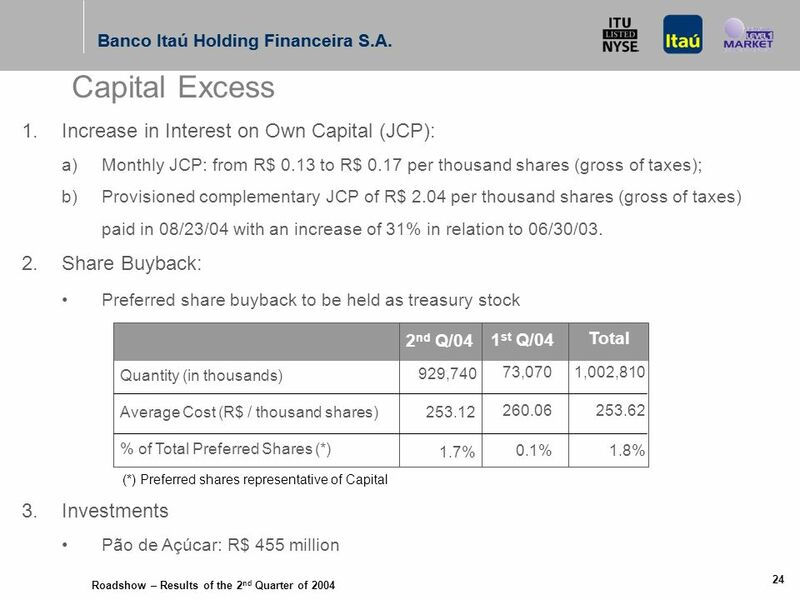 Source: Published Financial Statements. 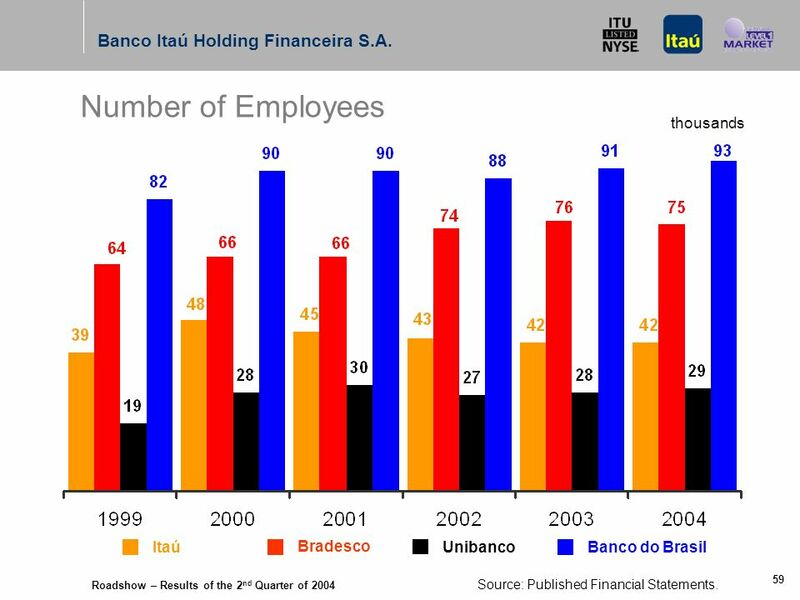 67 Roadshow – Results of the 2 nd Quarter of 2004 Banco Itaú Holding Financeira S.A. 66 Personnel Expenses per Employee R$ thousands Itaú Bradesco UnibancoBanco do Brasil (*) Annualized (1 st semester 2004 results doubled). 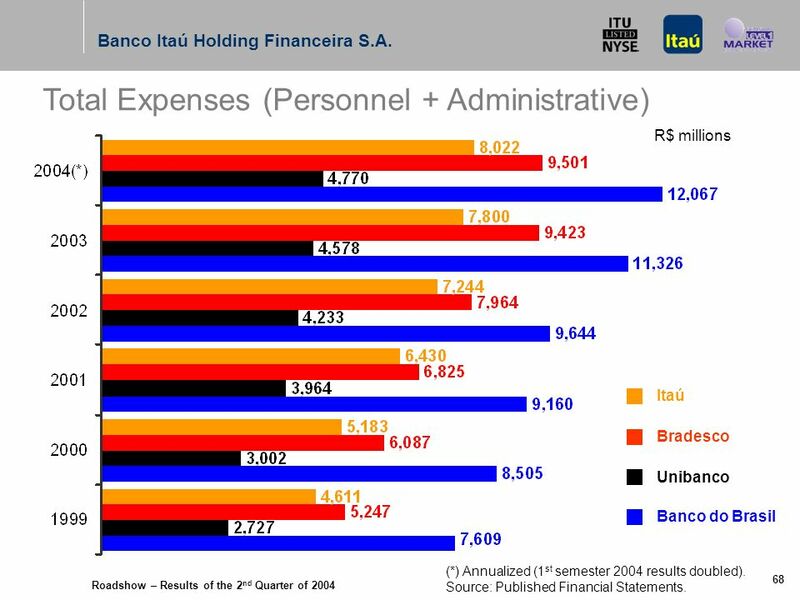 Source: Published Financial Statements. 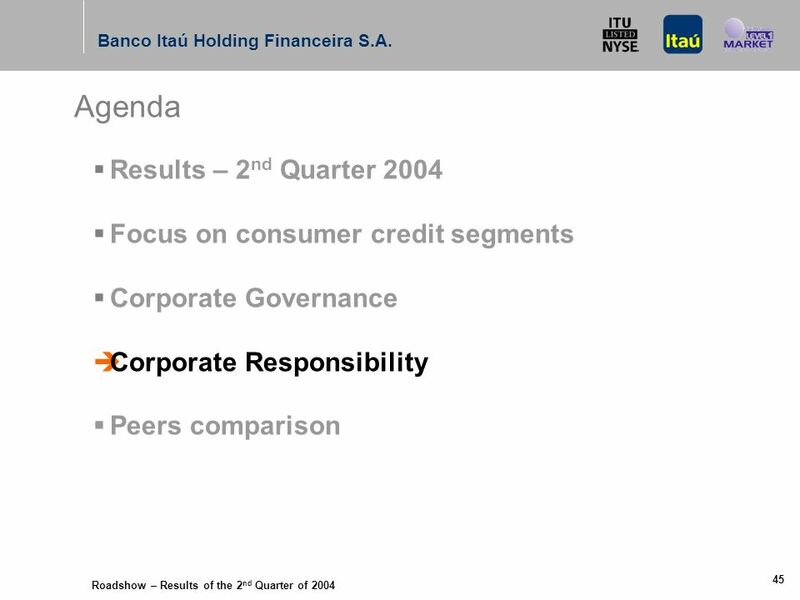 68 Roadshow – Results of the 2 nd Quarter of 2004 Banco Itaú Holding Financeira S.A. 67 R$ thousands Personnel Expenses per Point of Sales (Branches + CSBs 1 ) Itaú Bradesco Unibanco Banco do Brasil (*) Annualized (1 st semester 2004 results doubled). 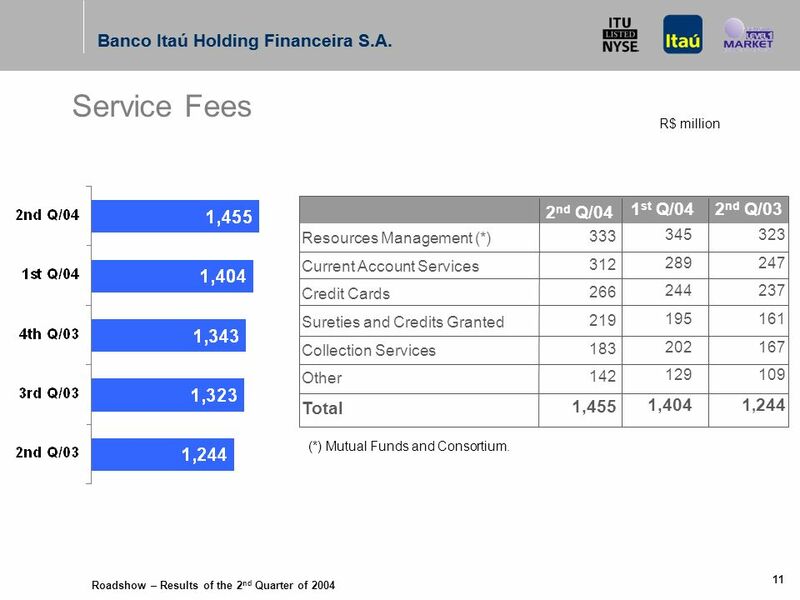 (1) CSB: Customer-Site Branch Source: Published Financial Statements. 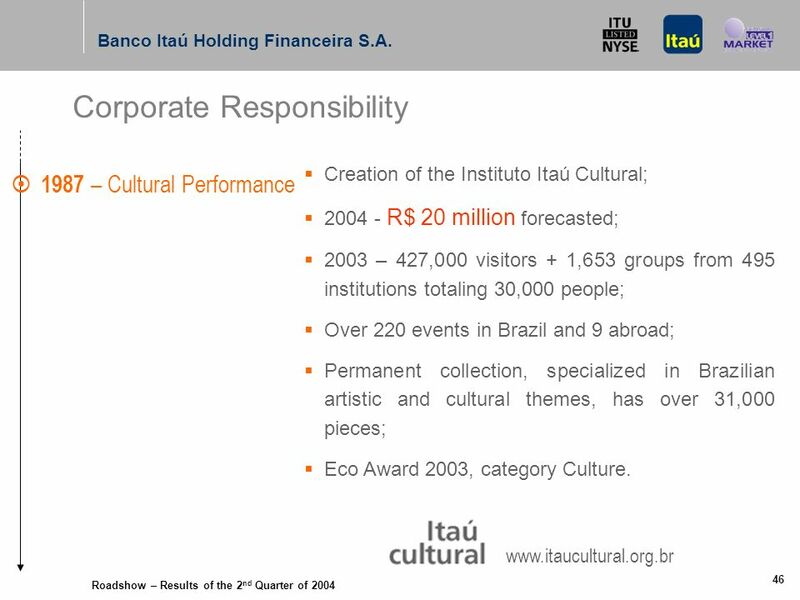 69 Roadshow – Results of the 2 nd Quarter of 2004 Banco Itaú Holding Financeira S.A. 68 Total Expenses (Personnel + Administrative) R$ millions Itaú Bradesco Unibanco Banco do Brasil (*) Annualized (1 st semester 2004 results doubled). 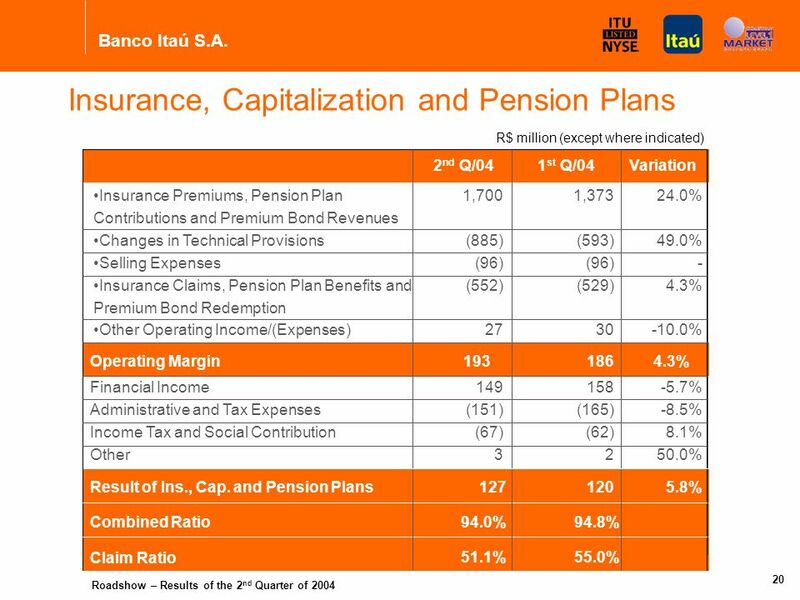 Source: Published Financial Statements. 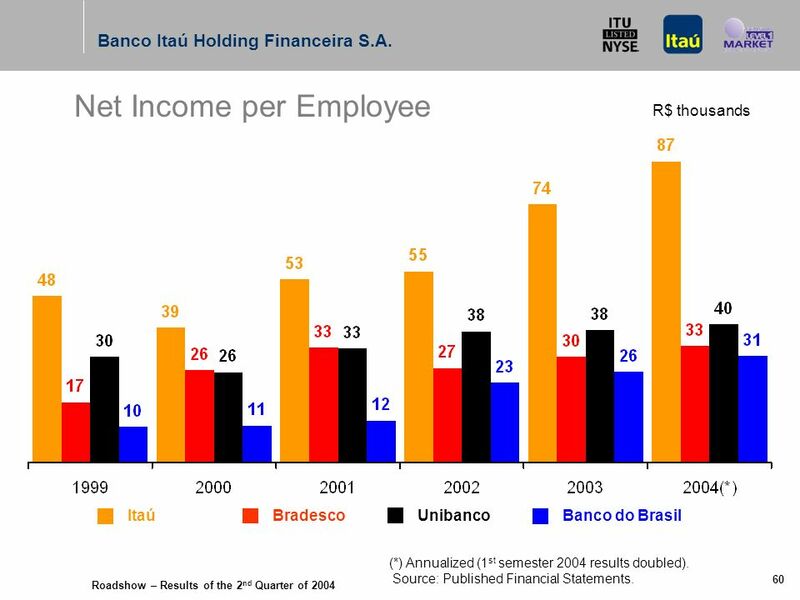 70 Roadshow – Results of the 2 nd Quarter of 2004 Banco Itaú Holding Financeira S.A. 69 Total Expenses per Employee R$ thousands Itaú Bradesco Unibanco Banco do Brasil (*) Annualized (1 st semester 2004 results doubled). 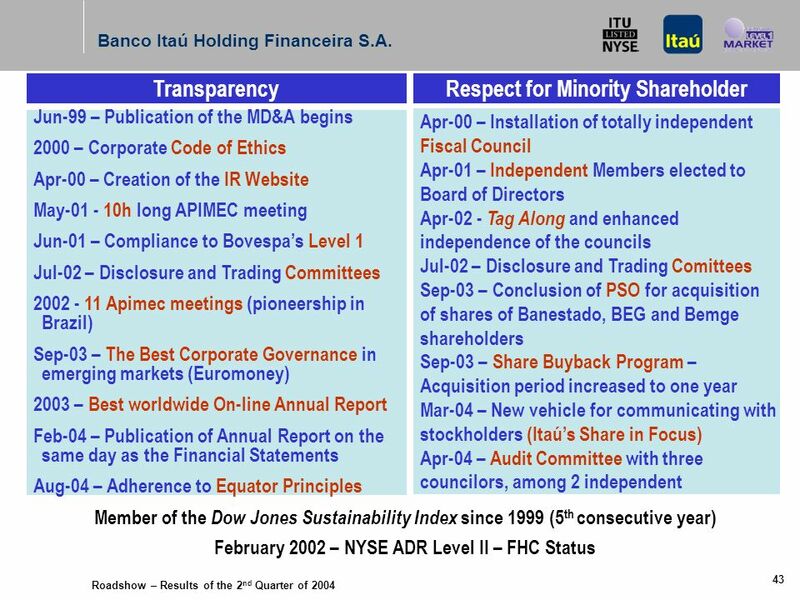 Source: Published Financial Statements. 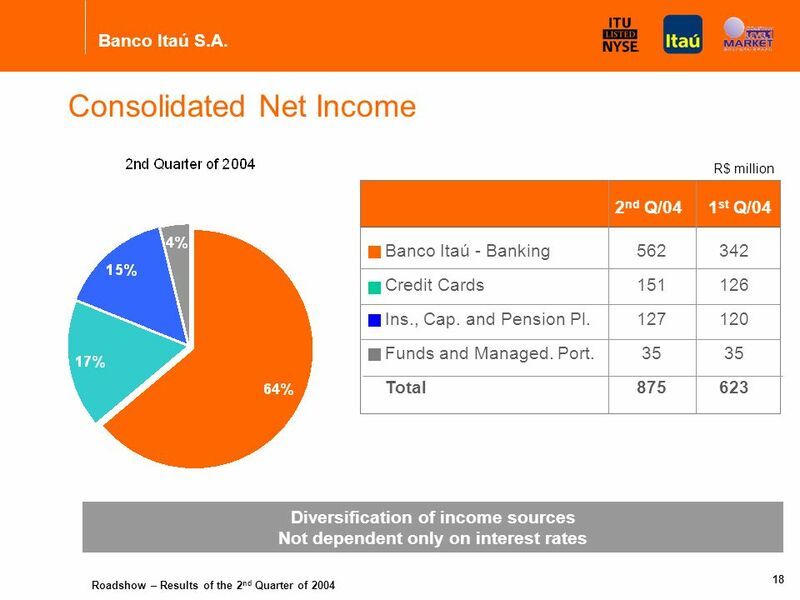 71 Roadshow – Results of the 2 nd Quarter of 2004 Banco Itaú Holding Financeira S.A. 70 Total Expenses per Point of Sale (Branches + CSBs 1 ) R$ million Itaú Bradesco Unibanco Banco do Brasil (*) Annualized (1 st semester 2004 results doubled). 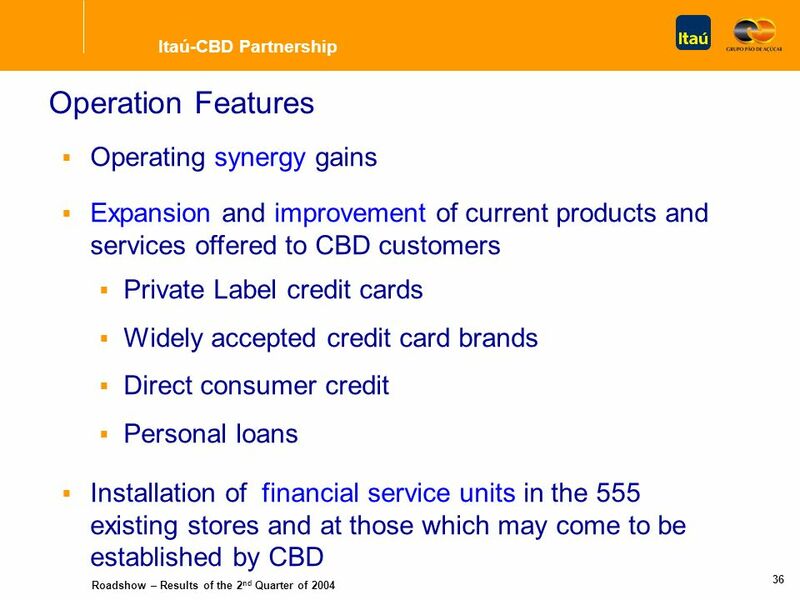 (1) CSB: Customer-Site Branch Source: Published Financial Statements. 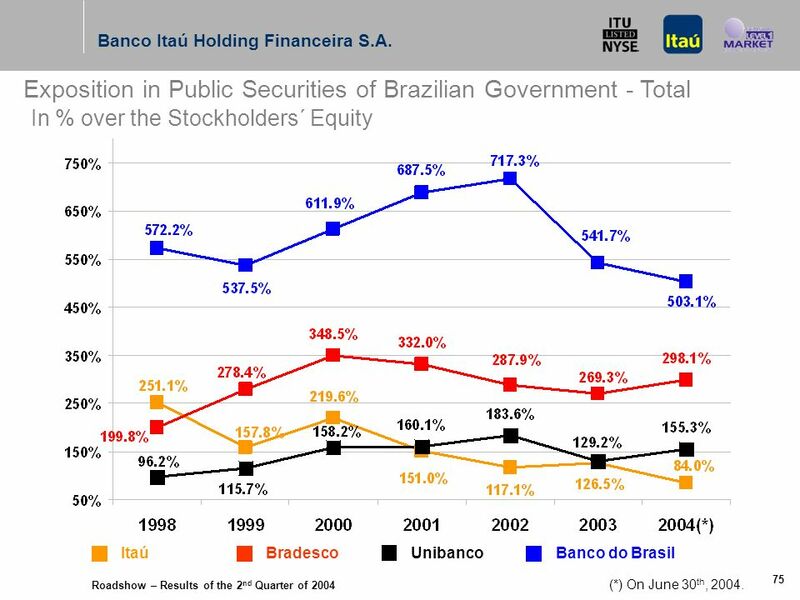 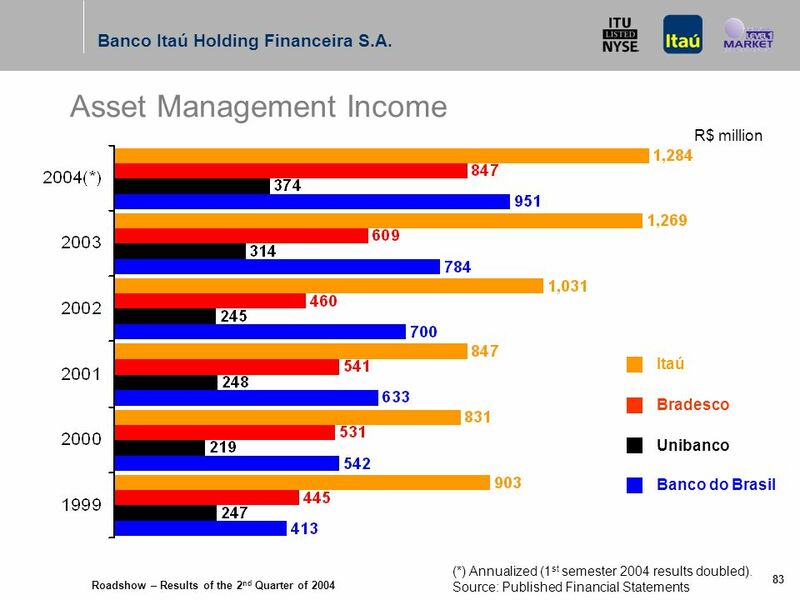 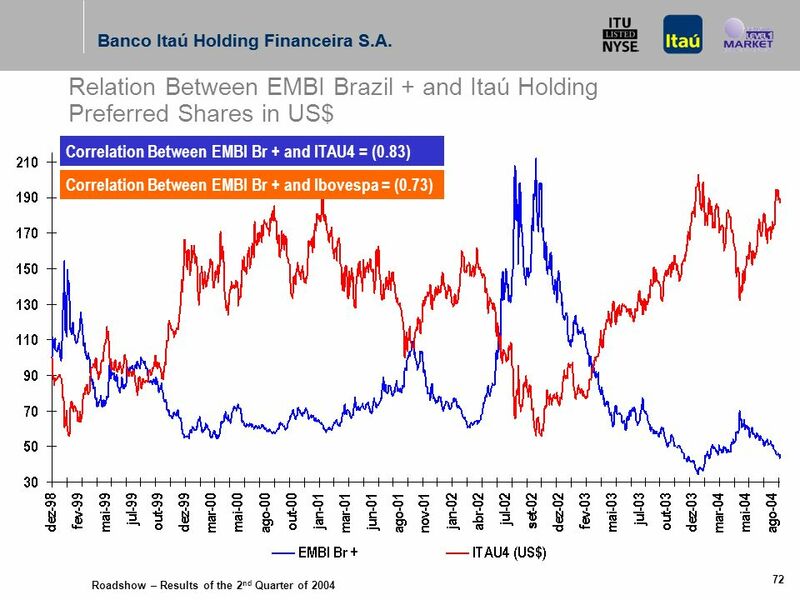 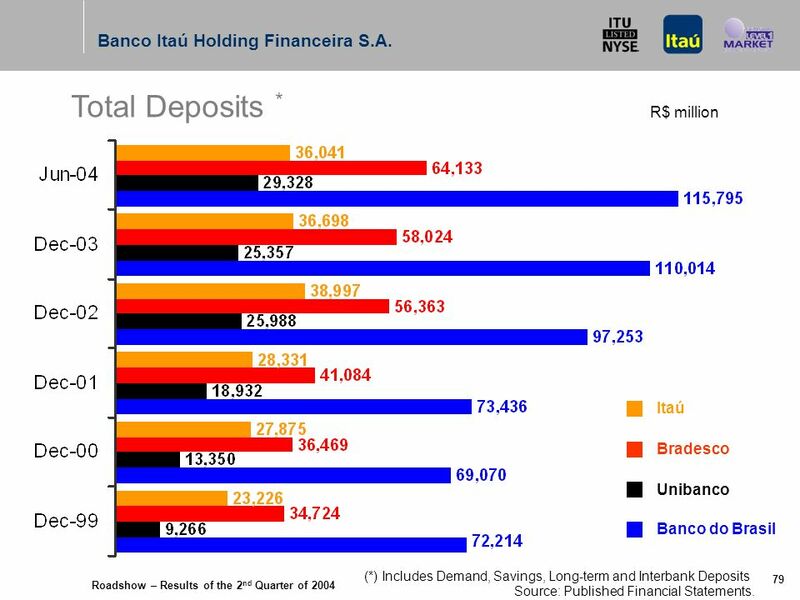 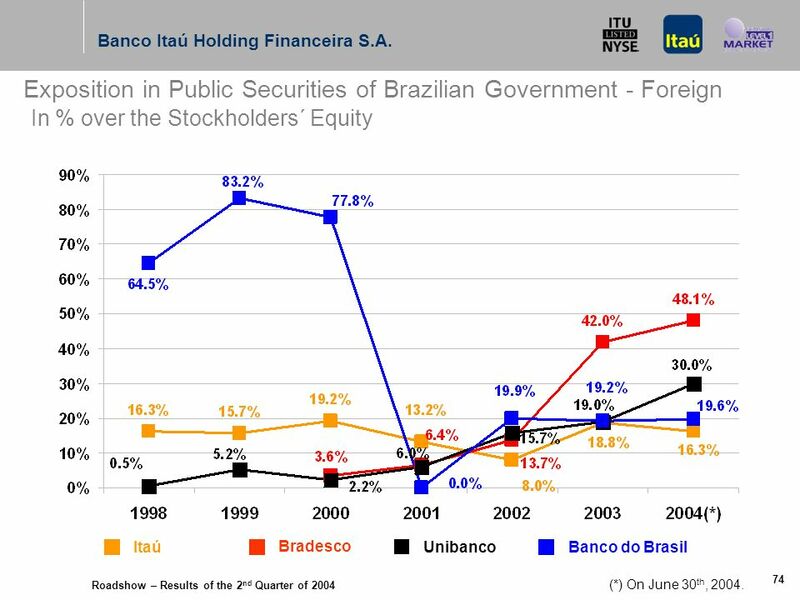 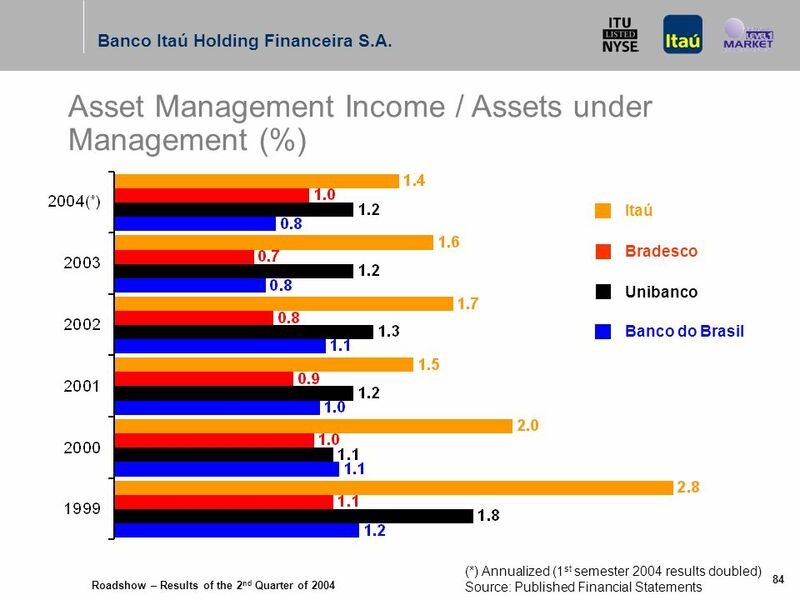 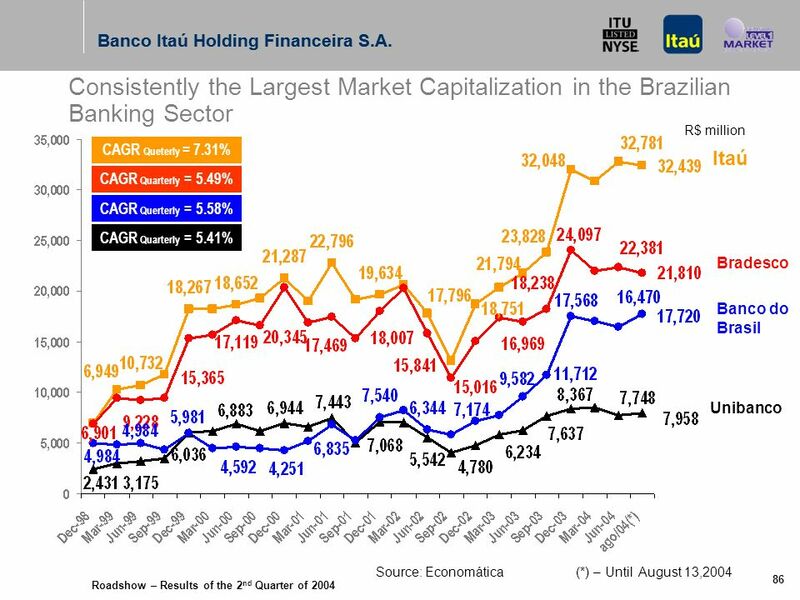 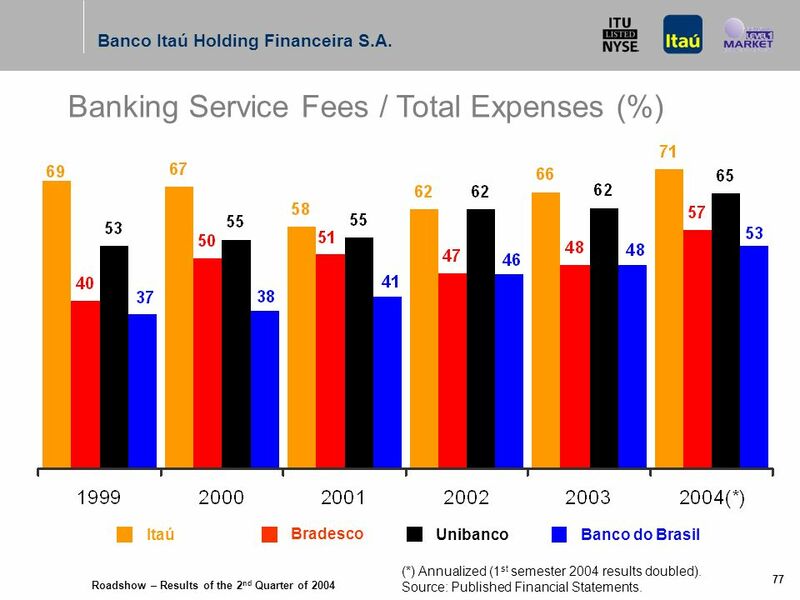 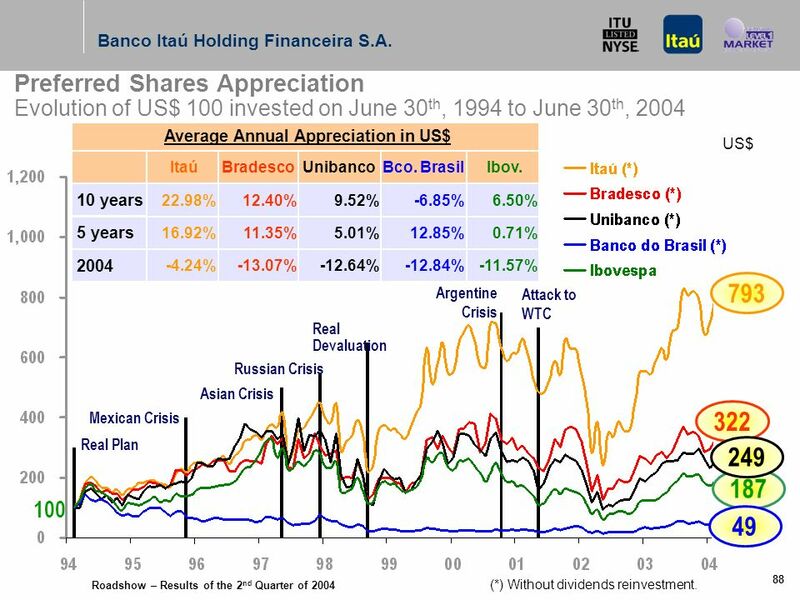 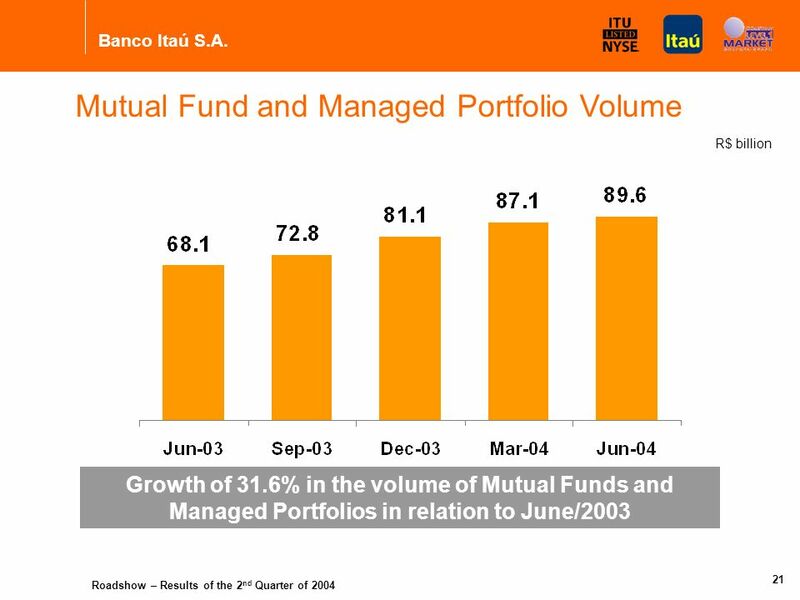 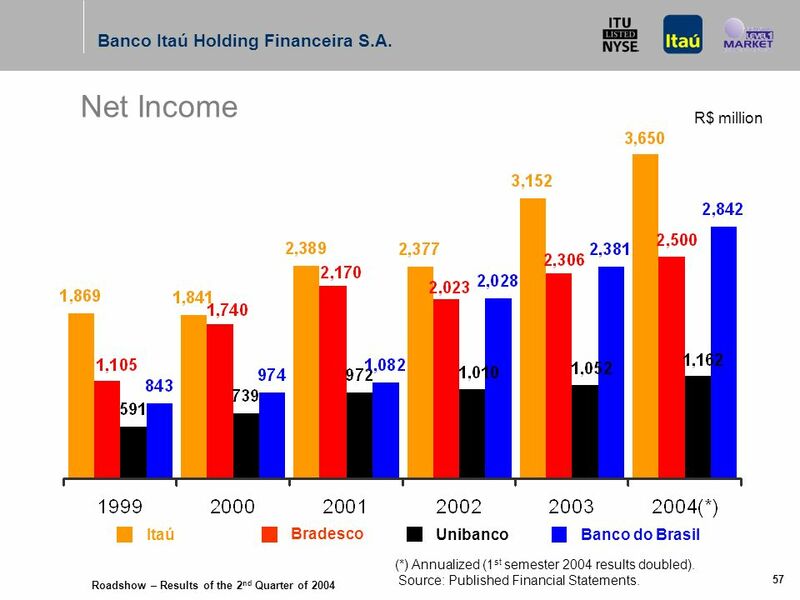 78 Roadshow – Results of the 2 nd Quarter of 2004 Banco Itaú Holding Financeira S.A. 77 Banking Service Fees / Total Expenses (%) Itaú Bradesco UnibancoBanco do Brasil (*) Annualized (1 st semester 2004 results doubled). 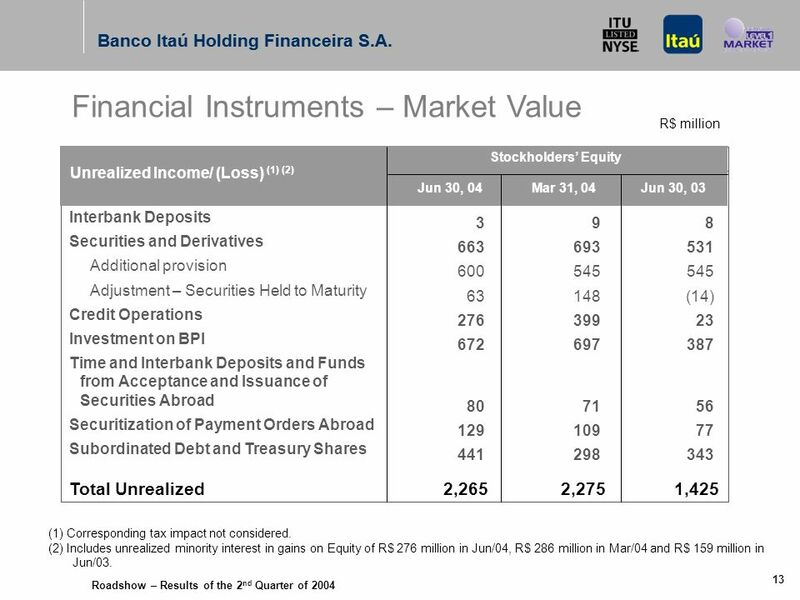 Source: Published Financial Statements. 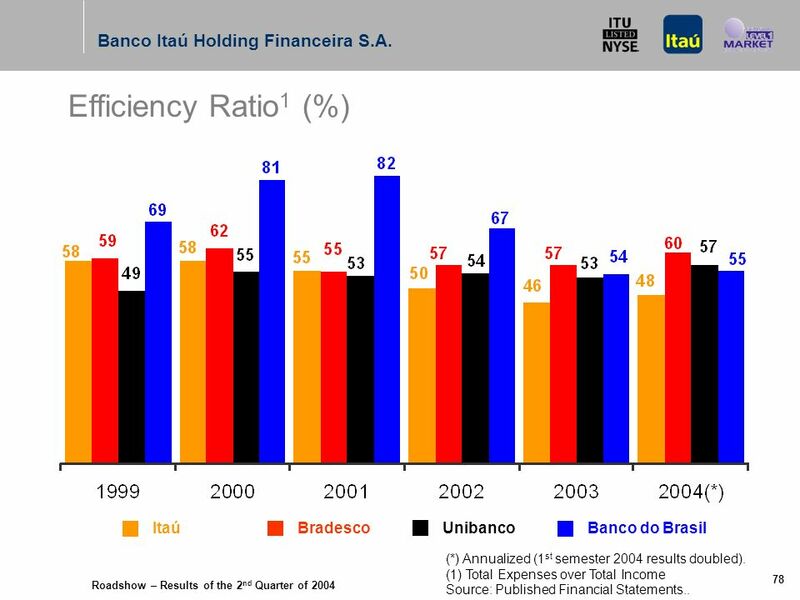 79 Roadshow – Results of the 2 nd Quarter of 2004 Banco Itaú Holding Financeira S.A. 78 Efficiency Ratio 1 (%) Itaú Bradesco UnibancoBanco do Brasil (*) Annualized (1 st semester 2004 results doubled). 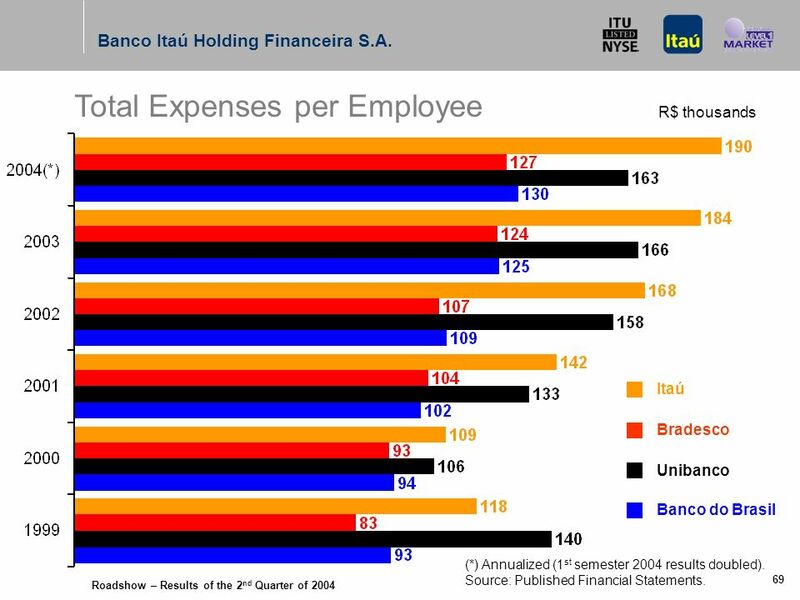 (1) Total Expenses over Total Income Source: Published Financial Statements..
80 Roadshow – Results of the 2 nd Quarter of 2004 Banco Itaú Holding Financeira S.A. 79 Total Deposits * R$ million Itaú Bradesco Unibanco Banco do Brasil (*) Includes Demand, Savings, Long-term and Interbank Deposits Source: Published Financial Statements. 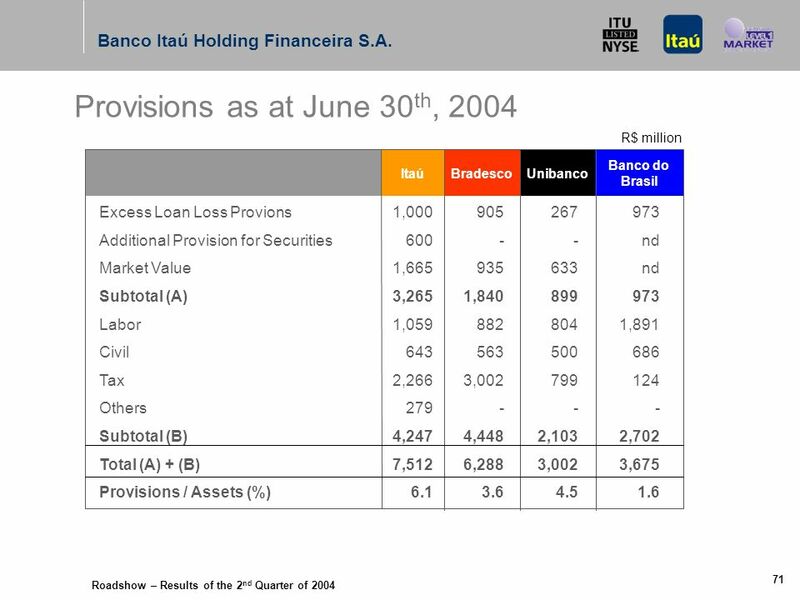 81 Roadshow – Results of the 2 nd Quarter of 2004 Banco Itaú Holding Financeira S.A. 80 Total Deposits per Employee R$ thousands Itaú Bradesco Unibanco Banco do Brasil Source: Published Financial Statements. 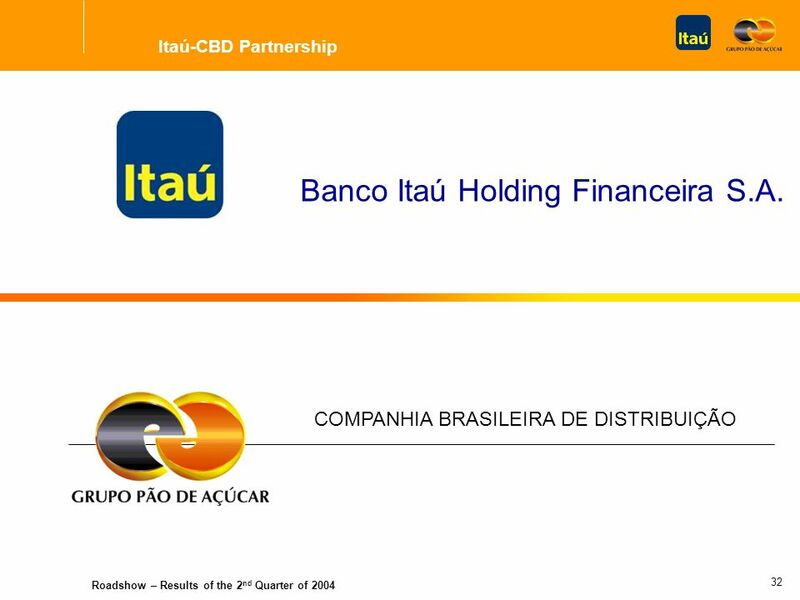 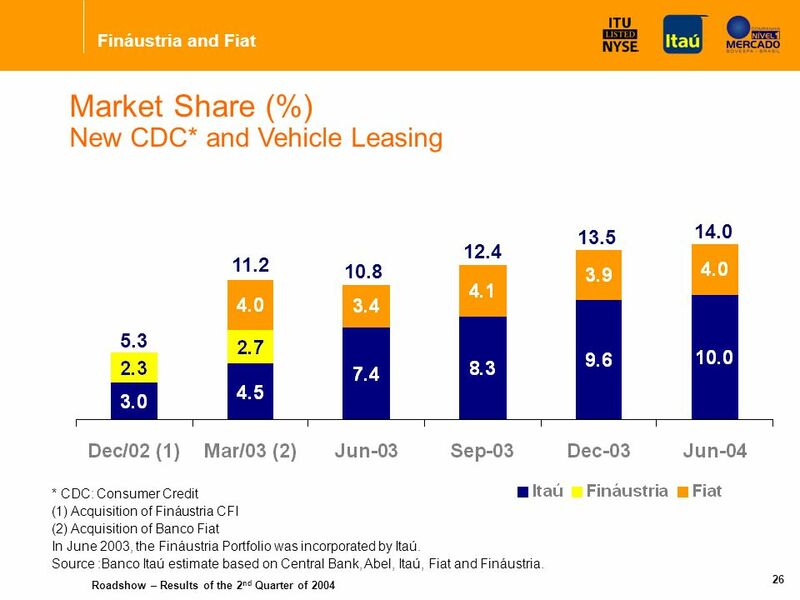 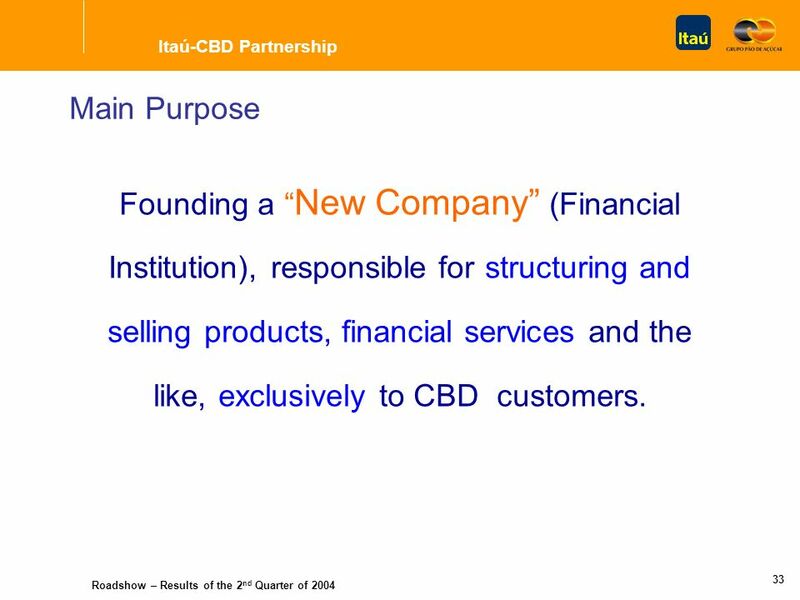 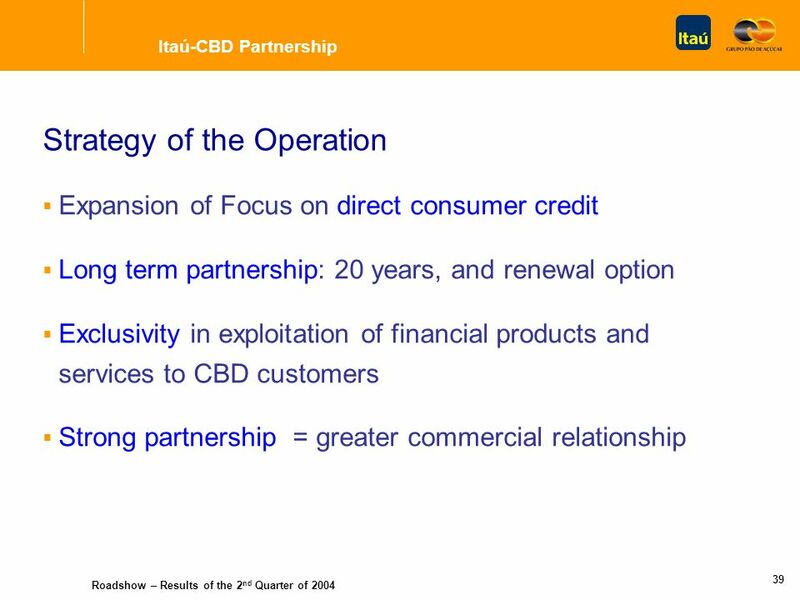 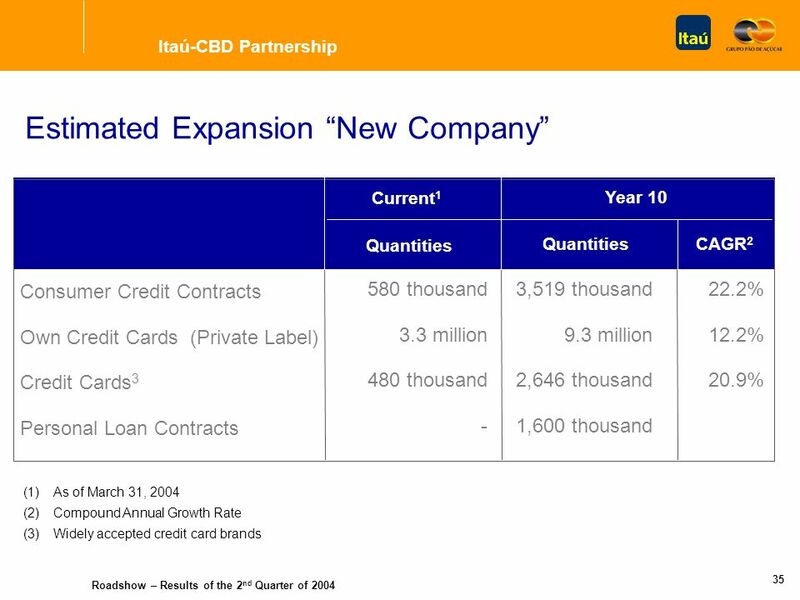 Download ppt "Banco Itaú Holding Financeira S.A. September 08-10, 2004 Presentation to: 3 rd Annual Global Markets One-on-one Conference New York Banco Itaú Holding."